Busan is a thriving metropolis situated between beautiful mountains and picturesque beaches. During our Grand Japan Windstar cruise last fall we ended up spending two nights and three days in Busan, South Korea while we sought shelter from the impending Typhoon Trami which was heading toward our next two ports of call - Kagoshima and Nagasaki in southern Japan. Because of the storm, our captain headed north instead to find shelter in the Seto Inland Sea where we would make our way to the Sea of Japan and sail to Busan. Busan was always on our itinerary but only scheduled for one day. 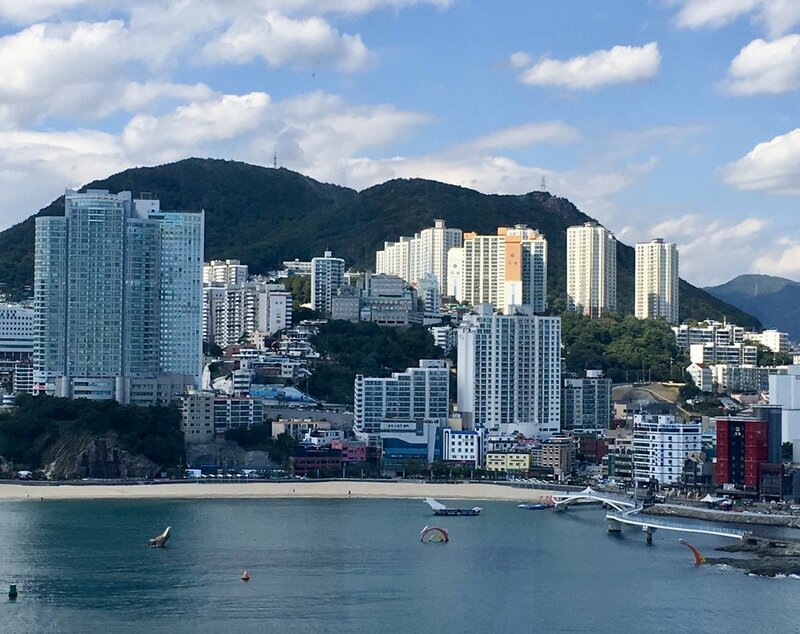 So, after skipping stops in Kagoshima and Nagasaki we found ourselves with plenty of time to get to know Busan, the second largest city in South Korea. 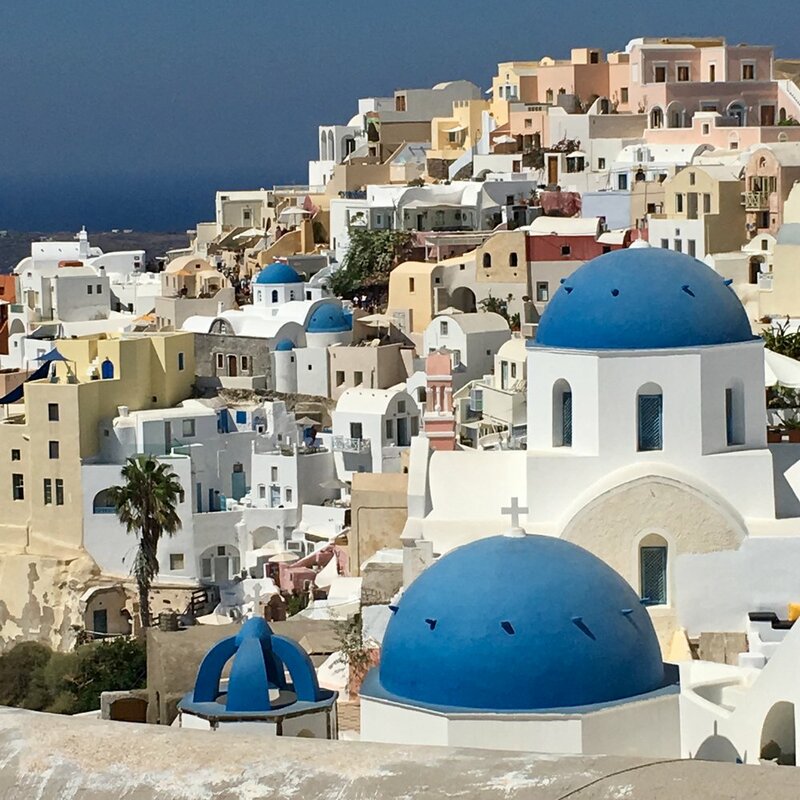 To Windstar’s credit, the crew and excursion team managed to take the unexpected detour in stride. The captain managed to secure a very convenient berth in the port of Busan even though we had arrived two days earlier than scheduled and the excursion team managed to add four additional excursions including a day trip by bullet train to the city of Seoul. We opted not to sign up for the trip to Seoul because it would have made for a very long travel day (2-1/2 hours each way on the train). Instead, we used all three days in port to explore Busan and we were glad we did because we fell in love with the city’s vibrancy, friendliness and culture. 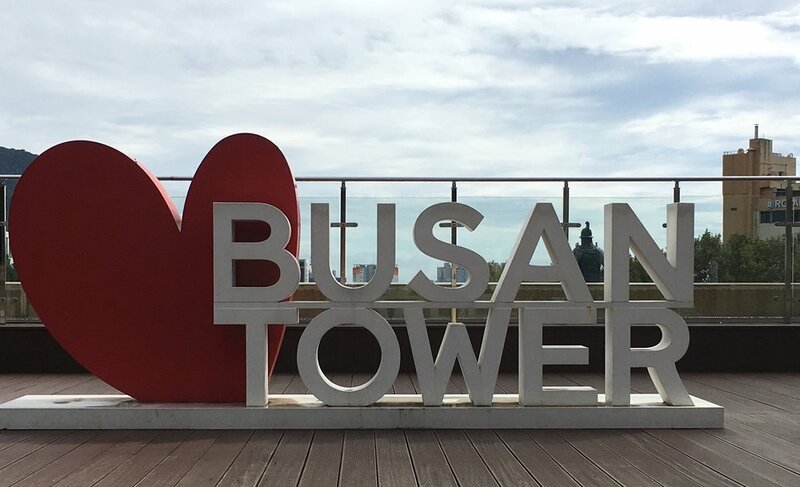 Below are our top 12 things to do in Busan. Korea’s largest seafood market is located on the edge of Nampo Port and sells both live and dried fish. The massive market is a dizzying array of bright colored bins filled with every type of seafood imaginable, many of which I had never seen before. You can select a fish and have it sliced on the spot for you to eat sashimi style or head upstairs to the dining and cooking area of the market and have your fresh fish prepared at one of the many restaurants. It doesn’t get any fresher than that. 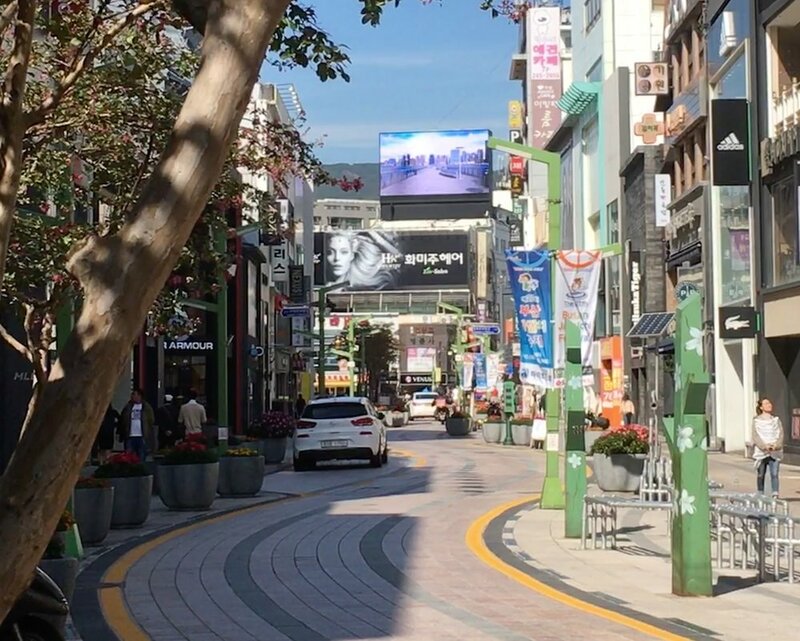 This area is considered Busan’s movie theater district and is also home to the city’s version of the Hollywood Walk of Fame. Plaques displaying impressions of famous movie celebrities’ hands are on display along the street stretching from the Buyeong Theater in Nampo-dong to the overpass in Chungmu-dong. The Busan International Film Festival (BIFF) is held in the fall and is considered one of Asia’s most significant film festivals. It is a bustling street year-round with both tourists and locals shopping, eating and taking in the atmosphere. The most popular street food here is the ssiat hotteok, a pancake stuffed with seeds, brown sugar, honey and peanuts. There are many stands, side-by-side, selling the snack so look for the one with the longest line if you want the best. 4. Grab a seat and have a snack on “Sit and Eat Street” at the Gukje Market. This street is actually part of the Gukje Market which encompasses multiple streets set up like flea market. 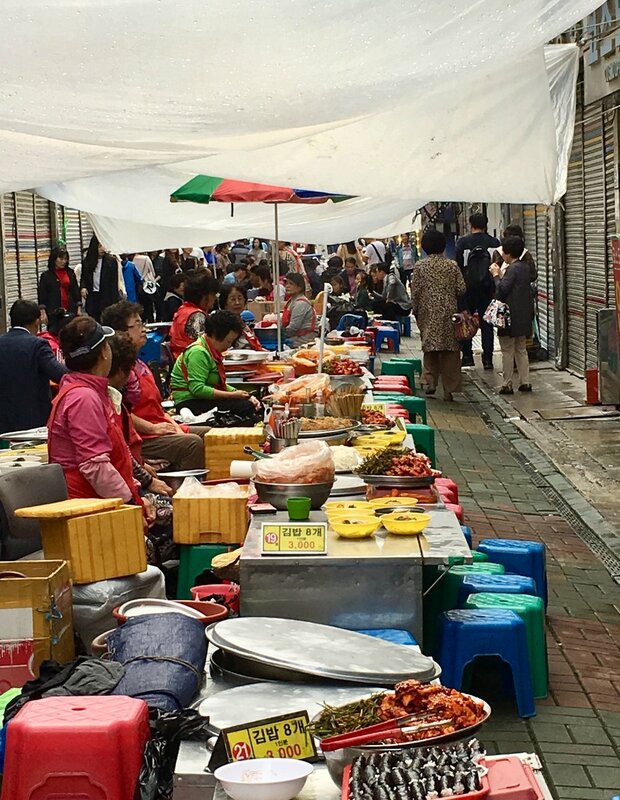 It dates back 60 years when Korean refugees fled to Busan and set up stalls in this area to sell food and household items in order to make a living. It operates roughly the same today but food seems to be the biggest draw among tourists and local alike. Take a seat on one of the small, plastic stools and enjoy the fresh cooked street food including one of the city’s famous local snacks - chungmu gimbap, made with dried seaweed stuffed with rice and served with spicy radish and boiled squid. A trip to the top of the Busan Tower which towers 120 meters high provides great views, day or night. Enjoy the scenery inside the tower too as you walk through multi-media and interactive displays as well as plenty of photo ops. 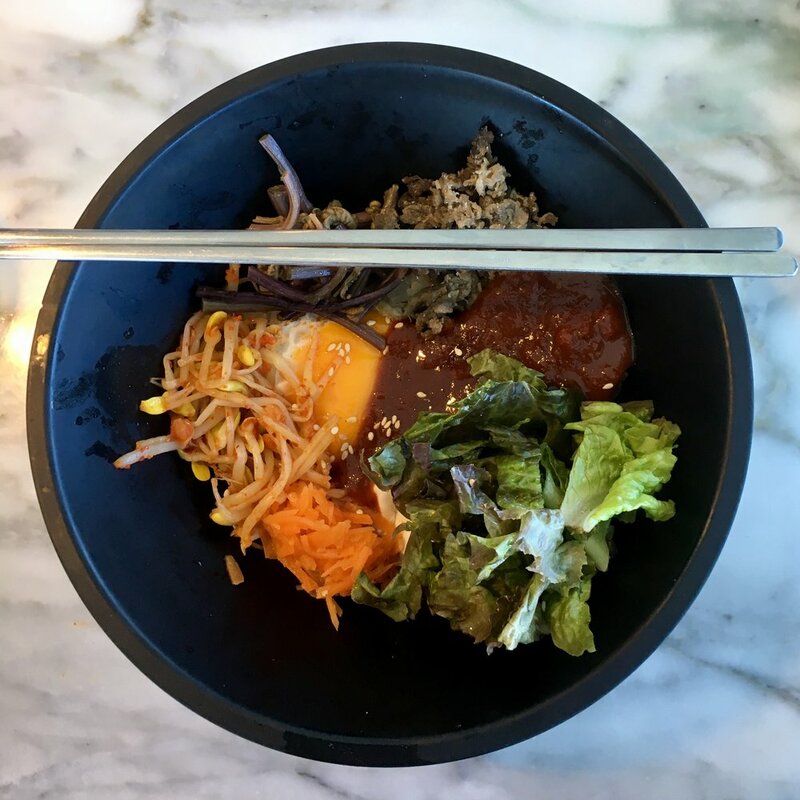 6.Enjoy a bowl of bibimbap while trying to master tricky Korean chopsticks. As far as I know Korea is the only country that uses metal chopsticks. In early times, it’s said the King used silver chopsticks as a way of protecting himself from being poisoned by his enemies, as the metal would change color when it came in contact with a poisonous chemical. Not only are Korean chopsticks heavier, they are also flatter and square in shape. They definitely took some getting use to. To say Lotte is just a department store is a huge understatement. It’s basically its own town complete with a hotel, sports center, cinema, art gallery, giant food hall, restaurants and rooftop garden. The quality of the merchandise was first class as was the entire shopping experience. The highlights for us included perusing the food hall and upscale grocery store on the lower level, “car shopping” in the kids’ department which included a race track for the mini sports cars and exploring the outdoor garden and viewing platforms on the upper floors. Catch a ride above the sea on the Busan Air Cruise from Songdo Beach to Songdo Sky Park. For an extra thrill, choose one of the “crystal” cabins with a totally transparent floor. There is plenty to do once you reach the Sky Park like trail hiking, having lunch, watching little ones enjoy the playground and taking in the view from the observation deck. This street used to be a stream but was covered over around 1895 because the area had become overpopulated and the water polluted. Today, the street mimics the curvy shape of the meandering stream and is lined with vibrant flowers and bronze sculptures. The street means “independence,” so it’s also known as Independence Road. After the Korean War, refugees and returning locals set about establishing the street as a successful commercial area with cinemas, restaurants and shops. It is still a lively area filled with shops, boutiques and cafes. Bonus tip: You can catch an escalator from this street that will transport you up the hill to Yeongdusan Park and Busan Tower. The Gwangandaegyo Bridge is beautiful by day but at night it becomes absolutely dazzling. Equipped with the world’s largest LED lighting and sound system for bridges, Gwangandaegyo Bridge lights up and even treats viewers to an amazing 10-minute laser show at 8:30, 9:30 and 10:30 every night. Haeundae is Busan’s most famous beach and is a popular vacation destination for many Koreans and tourists alike during the summer. This beautiful white sand beach with a shallow bay is the perfect spot for sunbathing, swimming and people watching. There are as many as 30 temples in Busan, one of the most popular being Haedong Yongungsa Temple located right along the coast. We visited the Beomeosa Temple (pictured above) which is one of the oldest temples in the city. 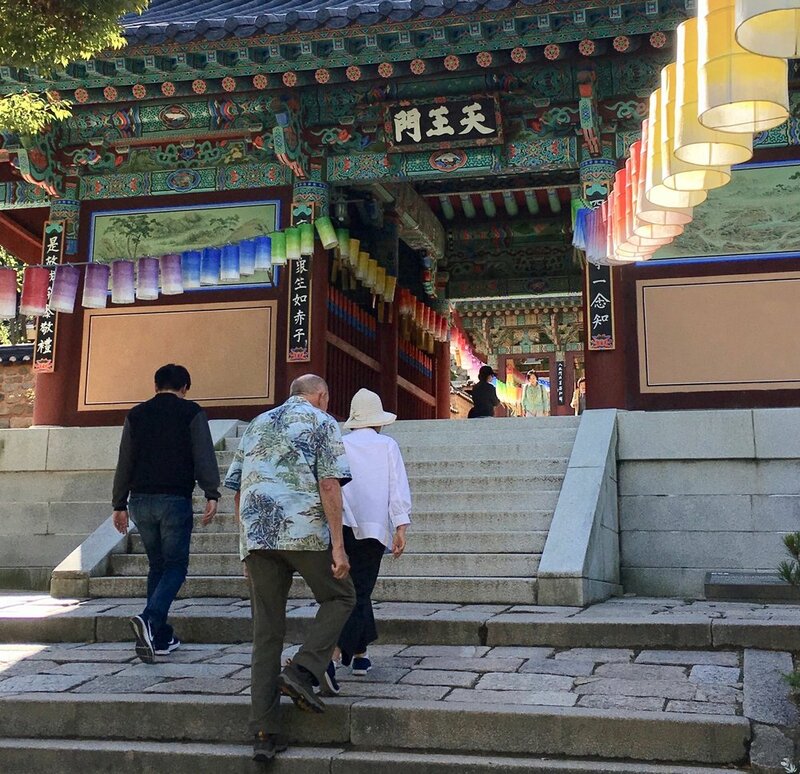 It’s about a 30-minute drive from downtown Busan to the mountainous area where you’ll find the temple nestled in amongst a beautiful forest. 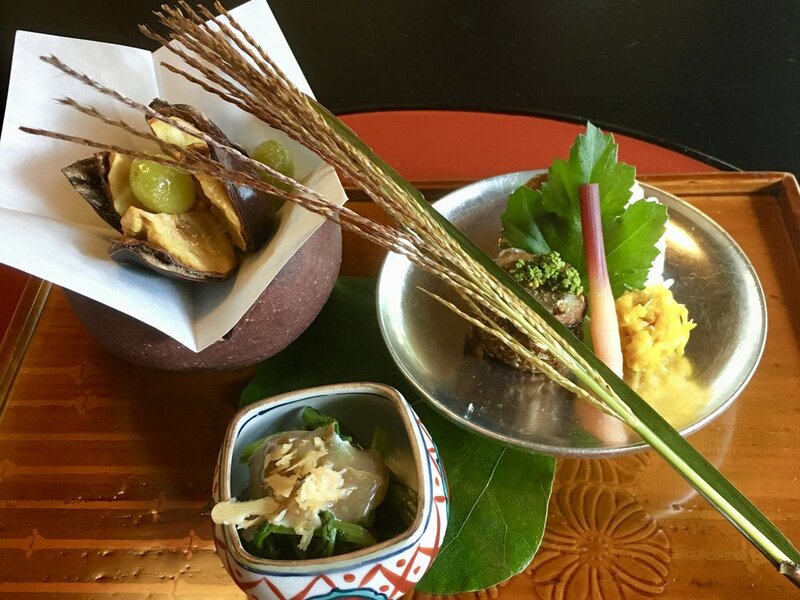 Wagashi has always played a role in Japanese tea ceremonies albeit a supporting one. The purpose of these beautiful confections was not to stand out, but to enhance the taste and enjoyment of Japanese tea. 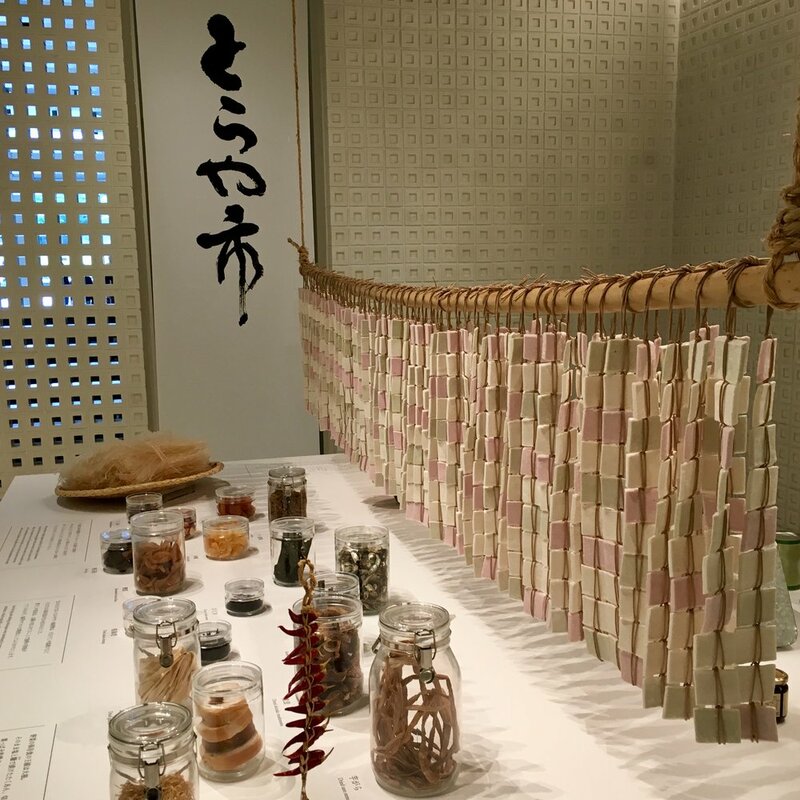 These delicate confections are the work of artisans who have passed down their skills from one generation to the next and can be found in many sweet shops throughout Japan including one of the oldest, Toraya. Toraya was founded in the Muromachi Period (1336-1573) and has been a purveyor to the Imperial Palace since the reign of Emperor Go-Yozei from 1586-1611. Founded in Kyoto, Toraya today now has 80 shops throughout Japan, a boutique in Paris and operates three factories. We visited Toraya’s Tokyo Midtown Shop and Tea Room in Roppongi for a sampling of these sweet treats during our visit last fall. 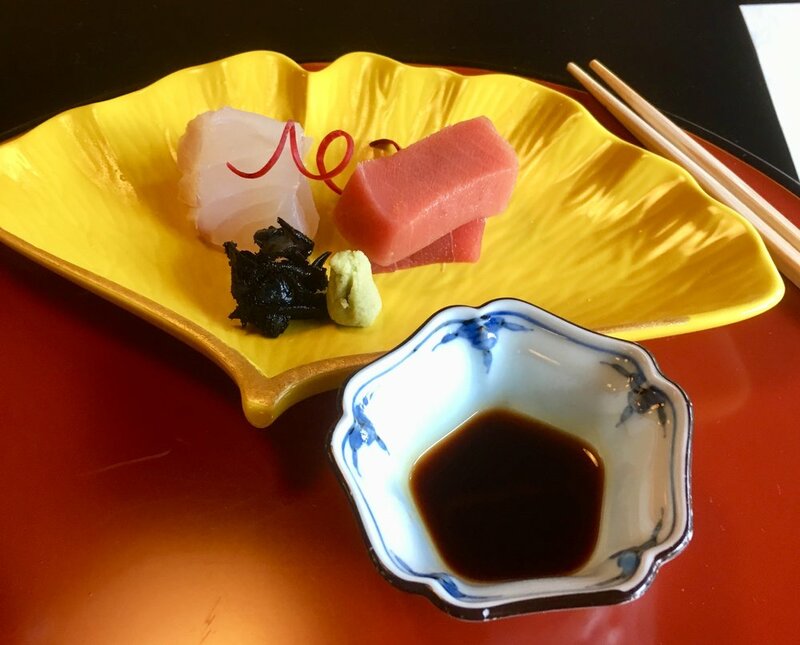 The ingredients in wagashi are simple - rice flour which is turned into a sticky, chewy dough known as mochi; bean paste; and agar-agar, a jelly-like substance. In the deft hands of a wagashi artisan these simple ingredients become a work of art as the dough is molded by hand and finished with traditional shaping tools to create delicate and intricate designs. The Tokyo Midtown shop in Roppongi features a gallery and rotating exhibitions. During our visit, various forms of food preservation techniques were on display including canning, bottling and drying. 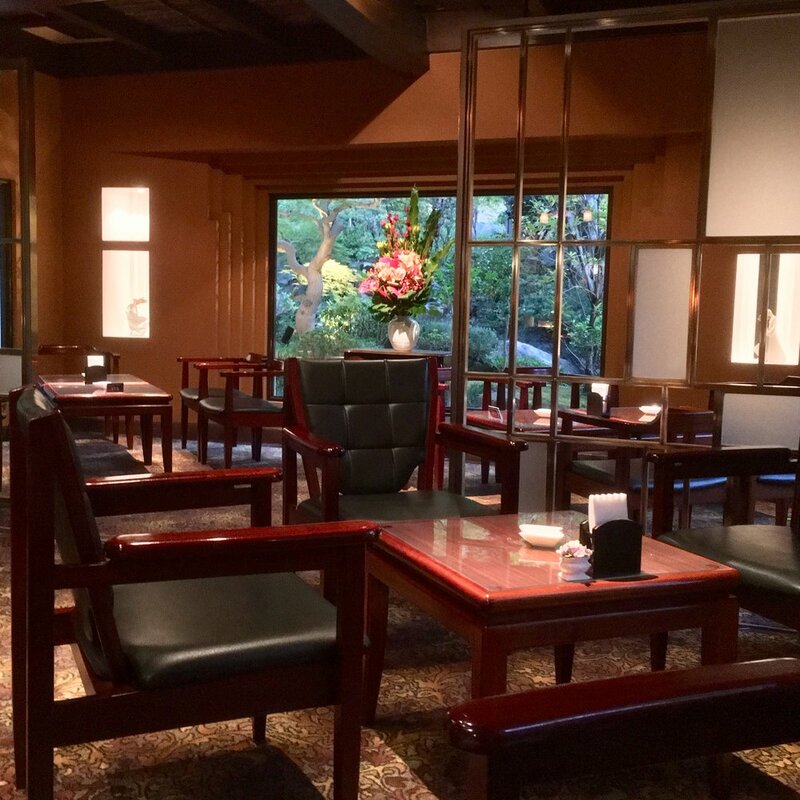 The tea room is located behind the noren curtain in the back where patrons can enjoy items from the special seasonal menus. 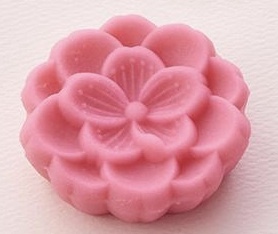 Wagashi confections are not just pretty to look at, there is also a story behind every design. Birds, flowers, animals and scenery of the seasons provide inspiration while history, literature and architecture guide context and structure. Wagashi is also designed to stimulate all five senses, which it did! Here are the stories behind the wagashi we enjoyed at Toraya. The fall Harvest Moon was the inspiration for the bunny bun. The design reflects a rabbit who stood up from the grass to admire the moon. Many artisans use rabbits as inspiration for their creations during moon viewing time. The tradition is based on an old Japanese legend about a mochi-making rabbit living on the moon. The second, two-color wagashi is named “Pine.” The green represents the color of pine and the purple is reminiscent of a color found on costumes of the Heian noble society. 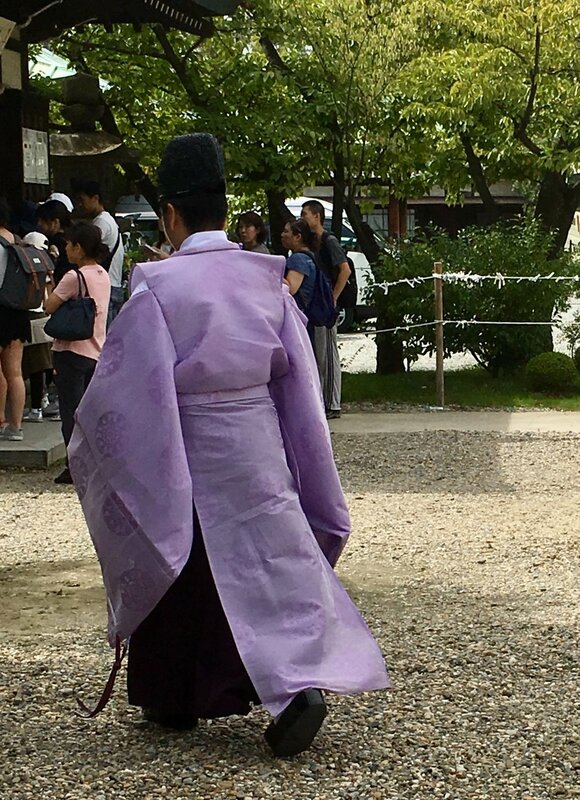 A shade of purple now only worn by Shinto priests during religious ceremonies like the the Shinto wedding below. 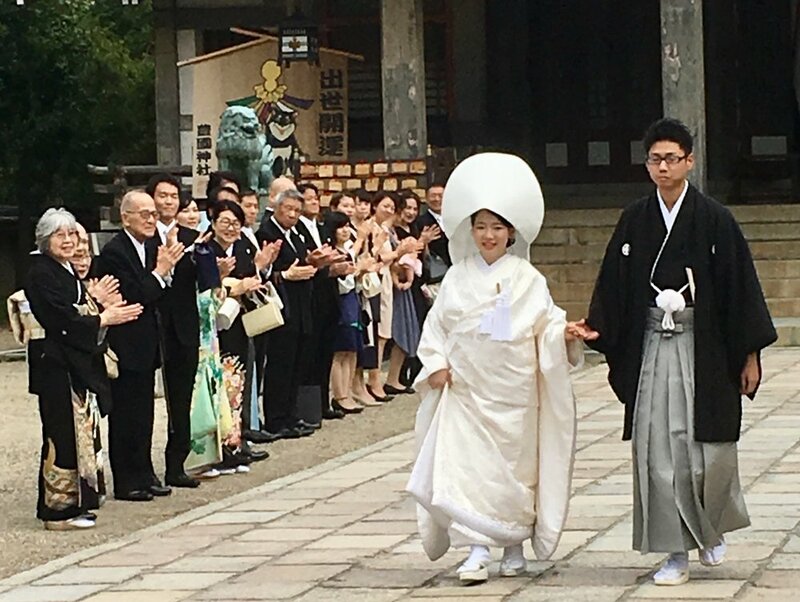 We came across this wedding party exiting the Hokoku Shrine in the Osaka Castle park. At the time, we didn’t know how rare it was to see an actual Shinto wedding and a priest wearing this color or that it was the inspiration for a sweet treat. Robes in this purple color are usually hanging in museums. Toraya first began making the Pine wagashi in 1834! Another sweet treat we experienced during our time in Japan was the Umegae Mochi. 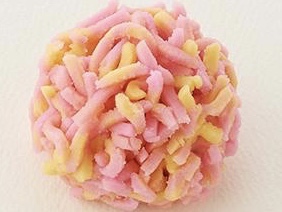 Fukuoka Prefecture is famous for this beautiful, little confection and it is hard to find elsewhere in Japan. The town of Dazaifu is lined with dozens of umegae mochi vendors and store fronts. It’s a little dumpling filled with red bean paste and wrapped in mochi-rice cake. The buns are cooked on a griddle and embossed with an apricot flower motif. 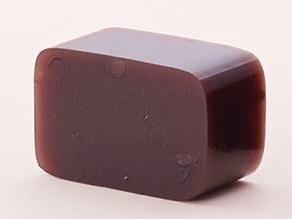 The name umegae mochi translates to plum rice dumpling but the confection is not made with plum. 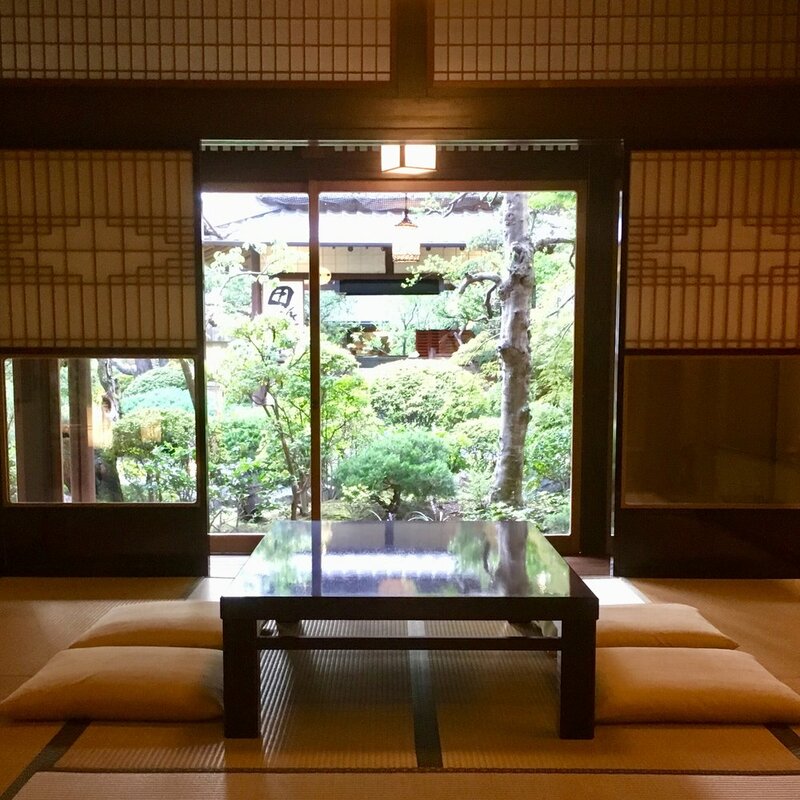 The name comes from a legend about a plum tree in Kyoto flying to Dazaifu to follow a scholar who moved away. In ancient times, sugar was very rare in Japan and so fruits and nuts took the place of sweets. Even to this day, fruits and nuts are considered a delicacy and are often used as gifts which are wrapped and presented exquisitely. I experienced the custom first-hand when a beautiful cluster of red grapes was delivered to my hotel room at the Tokyo Grand Hyatt along with a note from the hotel manager wishing me a happy birthday. Fruit in Japan is considered a luxury item and is an important part of the country’s gift-giving ritual. So when you visit Japan be sure to visit the department stores and sweet shops to see the beautiful array of wagashi, fruits and nuts. 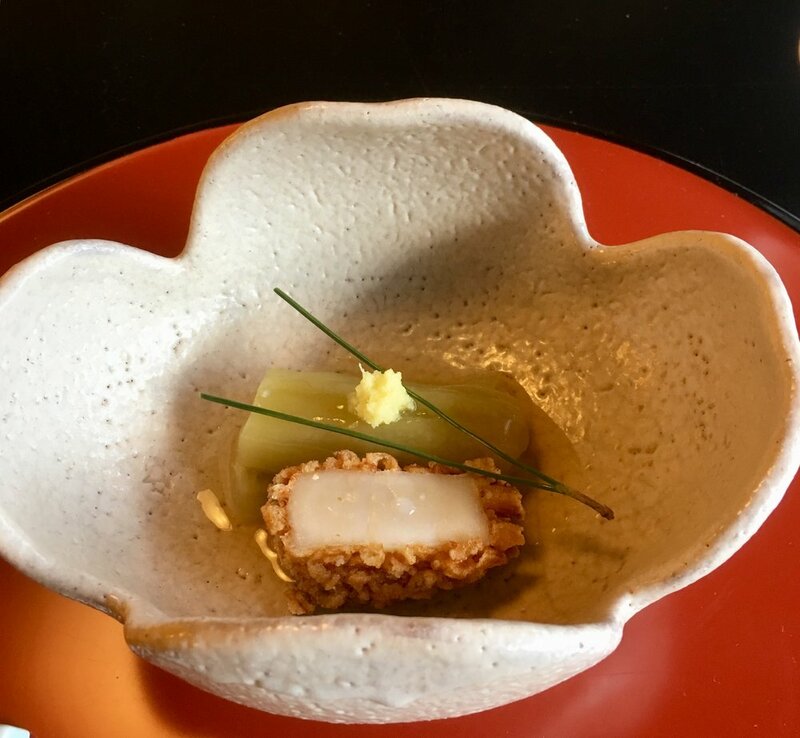 Toraya has a beautiful assortment of wagashi featured on its Instagram feed (toraya.wagashi) and is worth checking out to know the story behind various confections before you visit. Unfortunately, Celestyal Cruises has put its sailings on hold due to large U.S. Cruise Lines saturating the Cuba market. Celestyal will evaluate the situation and consider re-introducing sailings to Cuba in 2020. As an alternative, we recommend AZAMARA Cruise Line's "10-Night Circle Cuba Voyage" for a similar small ship experience. 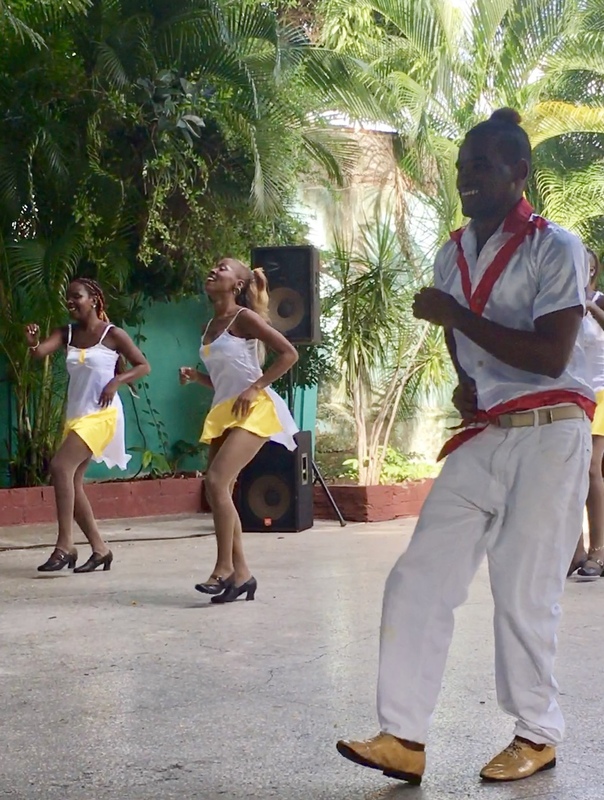 Our booking with Celestyal Cruises included a "Discover the Authentic Cuban Experience" Program which met the criteria of the Cuba Travel Affidavit and would provide us with a broad introduction to Cuba's rich history and culture. We also liked the itinerary which called on three ports and docked for two full days in Havana. Celestyal handled all of the excursions, programs and tours so all we had to do was show up at the correct time to meet our local tour guide or catch our assigned bus. 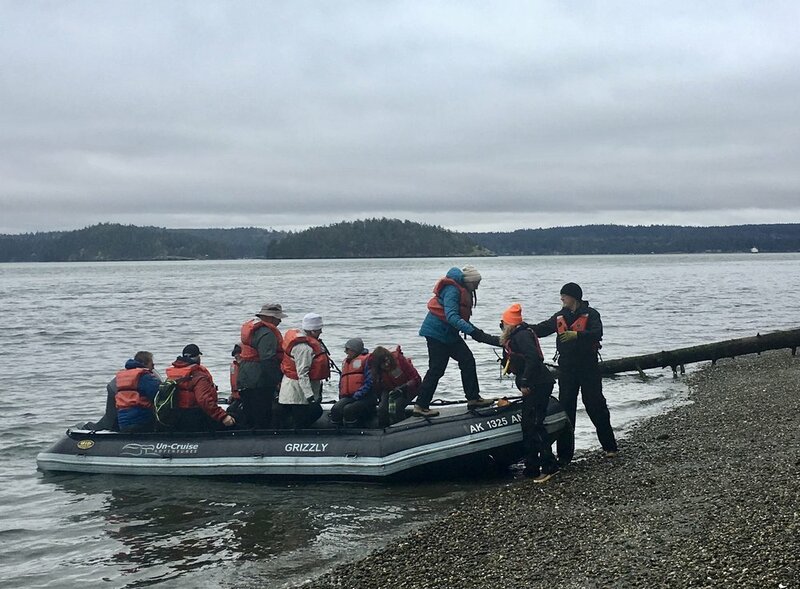 Our immersion experience wasn't limited to just our time on land. Onboard, we had the option to attend lectures by Destination Expert, Dr. Jorge Arocha, (Professor of Contemporary Philosophy of the University of Havana) on topics ranging from history, cuisine and art to music, cigars and rum tasting. I attended a few of Dr. Arocha's presentations and found him to be engaging, energetic and entertaining. * It is possible to visit Cuba on a self-guided tour but there are strict requirements to document your trip. We spent a couple of nights at the Holiday Inn Montego Bay before the start of the cruise because it's never a good idea to fly to a destination on the same day as embarkation. We always recommend arriving a day or two before your cruise in case you encounter any travel delays. The Holiday Inn was perfect for our group - it was all-inclusive, near the airport and had the amenities we needed for two days - beach, pool, bar, restaurant and a place to rest our heads. If you prefer something in the luxury category, there are plenty of 5-star, luxury resorts including Half Moon, Round Hill and Secrets Wild Orchid to name a few. We scheduled a shuttle for our group of ten from the Holiday Inn to the port. The drive took about 45 minutes due to bumper-to-bumper, rush hour traffic but we boarded well before embarkation so we had no worries. The check-in process was a little confusing with multiple lines and some in our group were charged a departure tax (even though we would be returning to Jamaica). Our ship, the Celestyal Crystal was easy to explore. 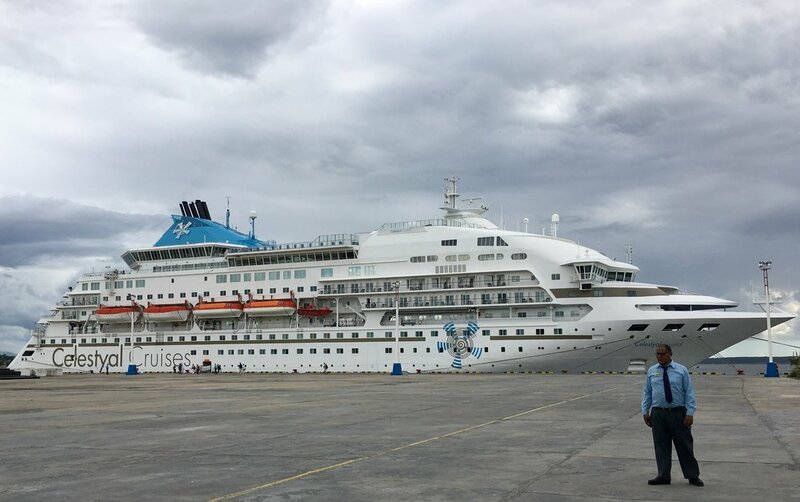 At 162 meters long, it featured ten decks with accommodations for 1200 passengers and 406 crew and was the first ship to offer around-Cuba sailings. The Crystal had everything large cruise ships offer but on a more intimate scale. The public spaces, lounge and restaurants had touches of Art Deco design but other spaces like the Sports Bar/Card Room and tiny casino looked tired and in need of some updating. 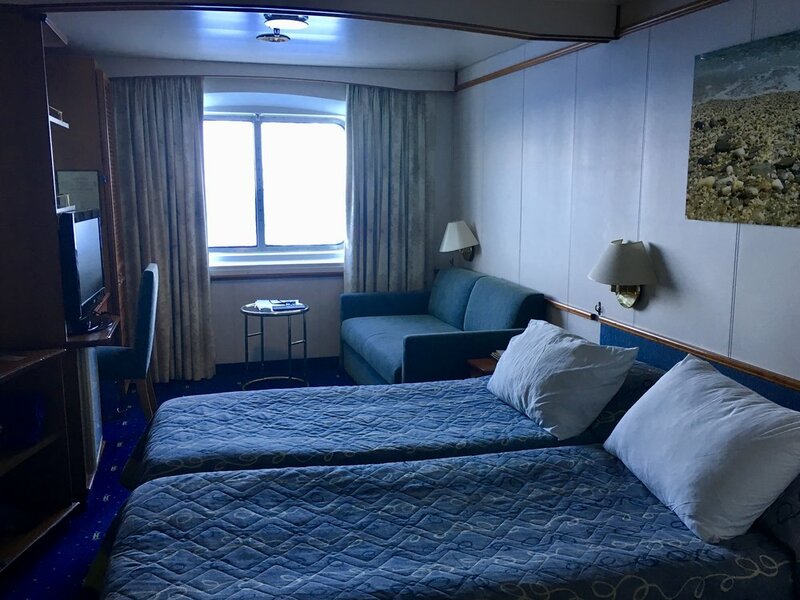 Our cabin was decent-sized with two twin beds, sitting area, desk, ample closet and storage space and a large picture window. The furnishings were stylish but basic and the beds were very comfortable. The dining room looked chic and contemporary and felt welcoming in soothing turquoise and tan tones. The cuisine in the dining room was okay with some hits and misses. Every fish entree I ordered was great, however the beef dishes always seemed to be overdone. There was a selection of entrees off the menu that were available for additional charge which included lobster tail, which was very good. Breakfast and lunch had a good variety of options served cafeteria/buffet style. The self-serve coffee machine always seemed to leave an oil slick on the top of my coffee so I opted to order a cappuccino from a bartender instead. I know a lot of ships have those automated coffee/espresso machines and some work great but others I question how often they are cleaned. The meals were fine, just don't set your expectations too high or you will be disappointed. 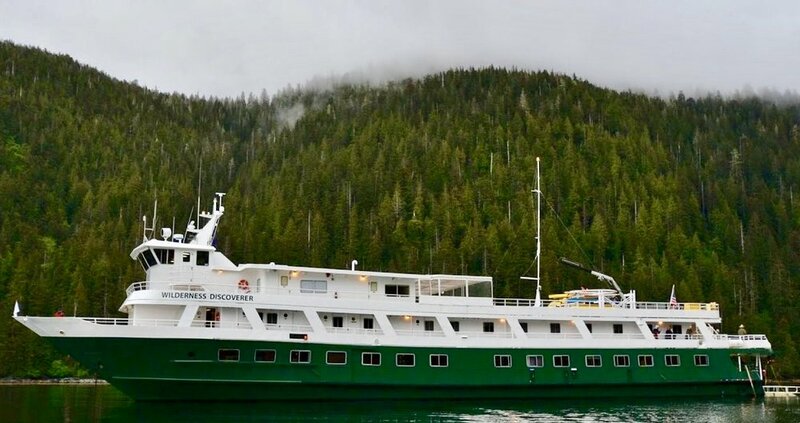 If you are into 5-star fine dining then this ship would not be a great fit for you. 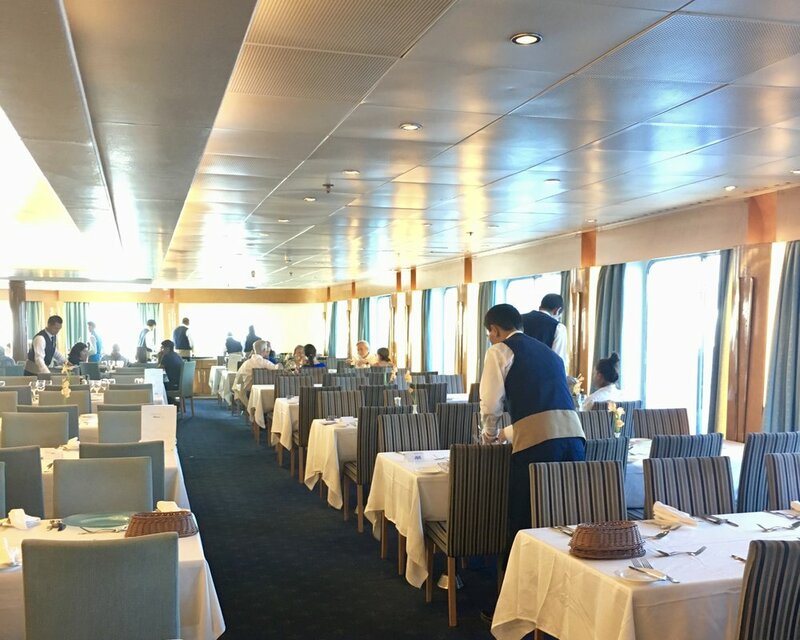 Thalassa, the terrace bar at the aft of the ship, was a popular spot. The seating arrangement can feel a little tight and one side of the deck is the smoking area but it was a great end-of-the-day gathering place for our group. Our first morning in port we met in the lounge to be assigned buses and guides. On this cruise it's important to attend these gatherings so you know what bus to get on. There are several buses each designated for specific groups and independent travelers and itineraries may vary depending on nationalities. Seating is limited and everyone must check in as they board their bus. Our first order of business after we disembarked and cleared Passport Control was to exchange money. There was a kiosk and small trailer with teller windows on the dock where we exchanged money before boarding the buses. In Cuba there are two forms of currency - the CUP and the CUC. The CUP (Cuban Peso) is what Cubans receive with a government salary. The CUC (called the "kook") is the convertible peso you receive when you exchange foreign currency. You'll need cash for all of your purchases (you cannot use US credit cards in Cuba) so it's good to plan ahead on what you want to buy and exchange just enough money so you're not stuck with CUCs and the end of the trip. We boarded our bus and began a tour of the old colonial city of Santiago, the 2nd largest city in Cuba and a major center for banking and commerce. There is also a lot of political history to be found in Santiago, including bullet-riddled buildings, monuments on former battle sites, statues celebrating revolutionaries and museums full of imagery and artifacts of the country's tumultuous beginning of the Cuban Revolution. One of our stops was at the Moncada Barracks, the site of the of the failed attack by revolutionaries led by Fidel Castro on July 26, 1953. Although this attack failed and led to dozens of injuries and some deaths, it is widely accepted as the beginning of the Cuban Revolution. 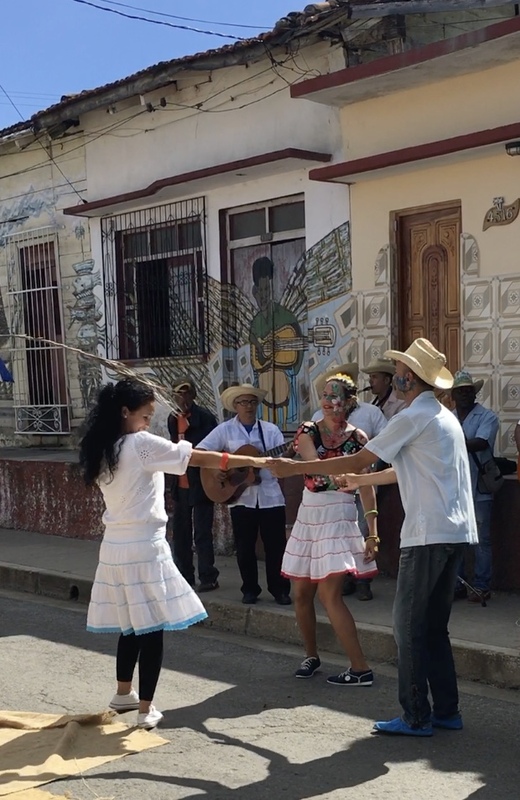 Other stops included Plaza de la Revolucion, the El Morro, San Juan Hill and the African Cultural Center to watch a traditional dance performance. Before heading back to the ship our guide took us into one of the island's government-run stores where cigars, cigarettes and liquor are sold. We had planned to buy some cigars in Havana but since we were carrying quite a bit of cash we decided to buy in Santiago and reduce the amount of money we were carrying around. It turned out to be a good decision because when we checked the state-run stores in Havana some of the cigars that were on our list to buy were sold out and some of the prices were slightly higher. In these stores the prices marked are what you pay. There is no negotiating in the state-run stores. 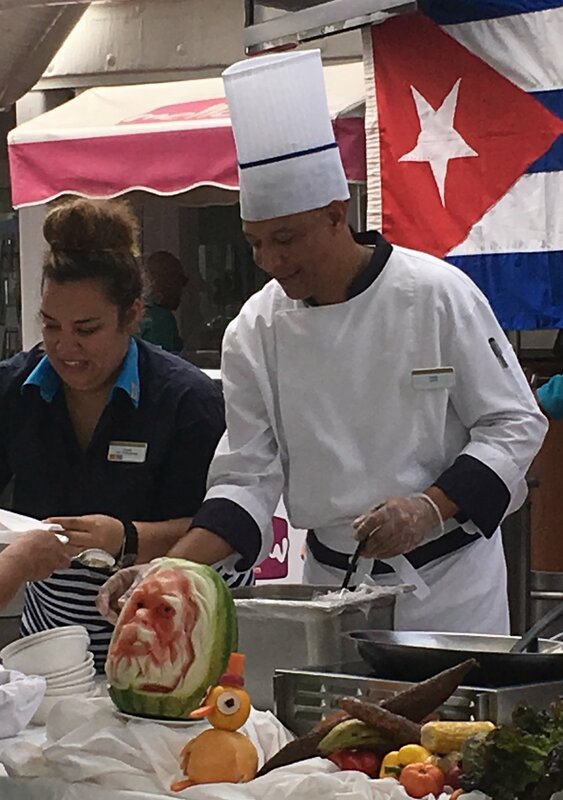 Our day at sea included many activities of a typical cruise - tour of the bridge, fruit carving demos, dance classes, towel folding, cooking lessons and Bingo. There was also a presentation by Dr. Jorge Arocha about "Cuban Cigars and The Story behind the Smoke." 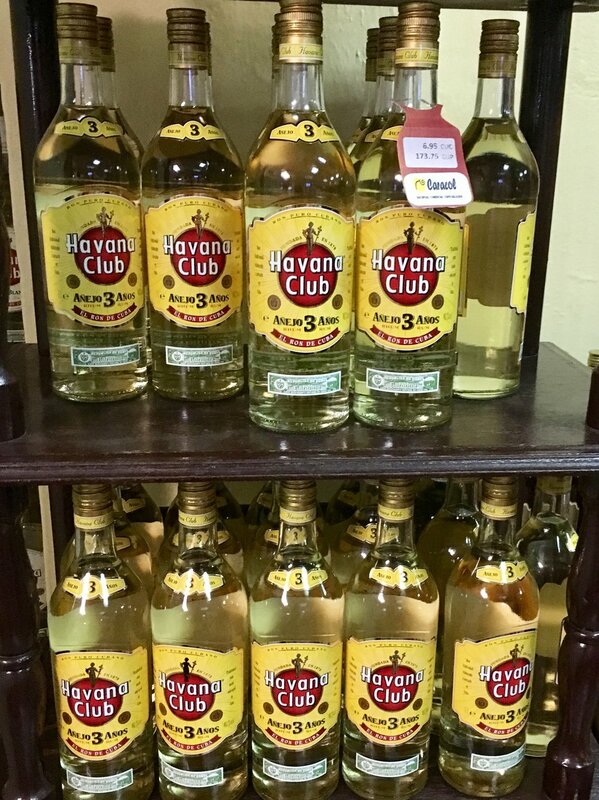 According to one of our local guides the top three Cuban cigars are 1. Cohiba, 2. Monte Christo and 3. Romeo & Juliet. One of the reasons we selected Celestyal was because its itinerary gave us two full days in Havana. Some other cruise lines only have one stop on the island and some don't stop in Havana at all but dock in another city and bus passengers to the capital city for day trips or over-night trips which means you have to pack a bag and stay in a hotel. Our ship was docked right at the foot of Havana's old town and a just a short walk to San Francisco Plaza, one of the four major plazas in Old Havana where our walking tour began that morning. 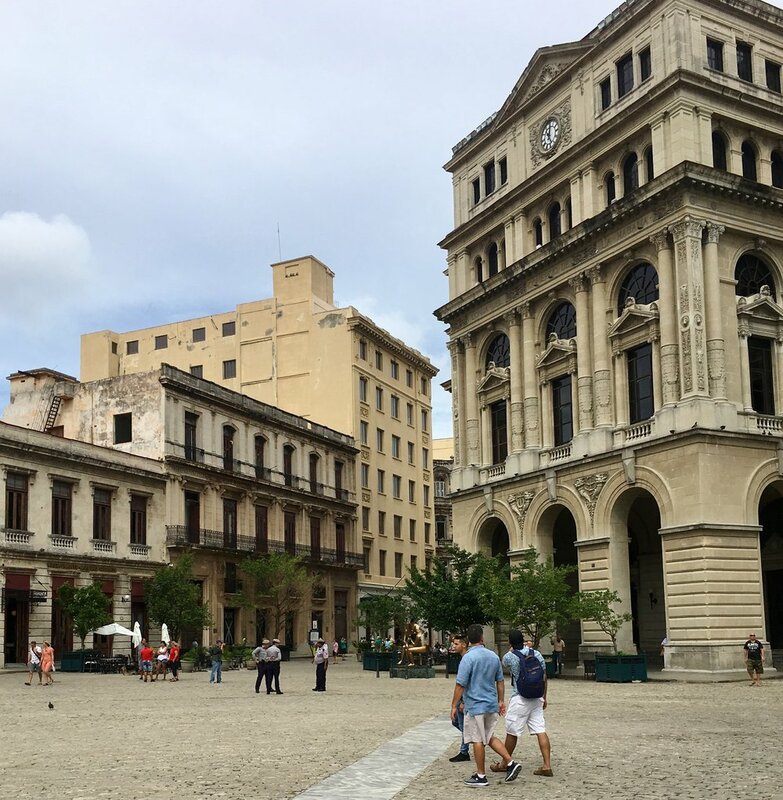 The tour took us through the "cobblestone core" of the colonial district with stops at some notable sites including some of Ernest Hemingway's haunts as well as the three other plazas - San Viejo (New Square), Arms Square and Cathedral Square. Many of the buildings being restored in this area used to be homes of wealthy aristocrats in 18th century Cuba. The parks and squares were clean and well tended but it was here we could see the impact tourism was having on the city. Dozens of tour groups stood huddled around guides holding umbrellas or placards reminiscent of so many tours in European cities. After our walking tour we had the option of returning to the ship for lunch or staying in town for lunch. We had lunch at one of the seafood restaurants recommended by our guide. The service was good and the fresh fish plate lunch we had was great. In the afternoon we boarded buses for a driving tour of the city. We cruised along the malecon past the new hotels, the American Embassy, and into the central district where many residents live. This area is "rent free" and is a little run down. Our final stop was at Revolution Plaza. After dinner on the ship we boarded a bus to the world-renown Tropicana to see its famous cabaret show. Touristy? Sure, but it was definitely worth visiting this open-air nightclub to watch the dancers dressed in their over-the-top costumes. If you go, don't expect much in the way of comfort or service. We were seated at long tables arranged very tightly with the rest of the audience and then provided with a bottle of rum and a couple cans of mixer (cola or soda) to share. If you want something else, good luck. It's not likely you'll see your server again. We didn't. The show (weather permitting) is still performed outside under a gorgeous canopy of trees like it was during the casino's heyday in the 1950's. 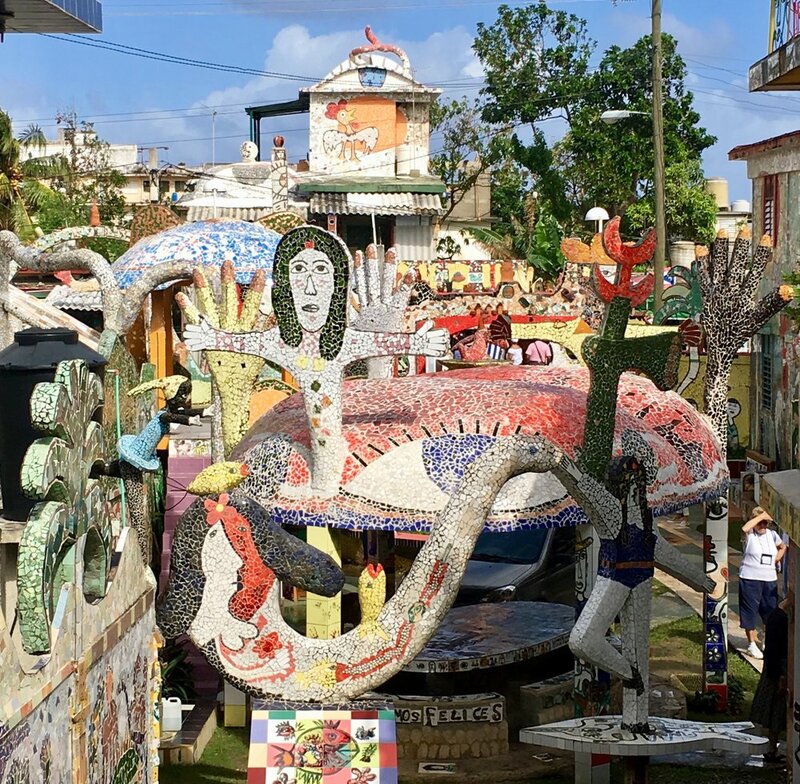 We began our second morning with a bus ride to the outskirts of western Havana to the mosaic wonderland of Fusterlandia. What started as a DIY project of Jose Rodriquez Fuster to liven up the facade of his house with mosaic embellishment has blossomed into a full-blown community project of converting almost every flat surface in the neighborhood into a canvas for shiny decorative shards. The whimsical and quirky designs stretch for blocks and can be found on walls, houses, flats, office buildings, schools and even the medical center. It all exemplifies the Cuban spirit through art and resourcefulness. On our way back to the ship the buses stopped at the Museo de la Revolucion which is a very well done museum full of photos and memorabilia from Cuba's revolution. Here, you will find all kinds of things on display including Che Guevara's beret, women's skirts lined with hidden pockets that were used to transport hidden guns and ammo and Granma, the small speedboat in which the Castro brothers traveled to Cuba from their exile in Mexico in 1956. In the afternoon, we had a period of free time until our ship left at 9pm. This was really the only extended period of time we had to see Cuba unescorted. We hired three drivers in American vintage "taxis" to guide our group of ten around the city. The cars are referred to by the locals as almendrones (translation - almonds) because they think the cars resemble the shape of a giant almond. Most drivers pay a fee to rent cars from owners so they need to make enough money to clear a profit after covering the day's fee. Be sure to negotiate up front where you want to go and for how long you want to have the driver. Our first request was to stop at the Hotel Nacional, famed for its ties to the mafia and as a gathering place for Hollywood's elite in the 1930's, 40's and 50's. As it turned out, our drivers were also excellent guides who knew all about the history of the hotel and showed us all around the property. We gained entrance into the Hall of Fame bar after one of our drivers knocked on the locked glass door and made eye contact with one of the bartenders who let us in. We enjoyed a couple of "mafia mojitos" while we looked around at all of memorabilia, movie posters and photos of politicians, sports legends and celebrities who had been there. After leaving the hotel, our drivers suggested a trip to see the imposing sculpture of Christ of Havana on a hilltop overlooking the Bay of the Havana with fantastic views of the city. It provided great photo opps. Our last request before heading back to the ship was to stop at an authentic paladar - a restaurant/bar operated by a private citizen. Many of these privately-owned restaurants are quietly tucked into backyards, courtyards and spare rooms behind unassuming facades of private homes in modest neighborhoods and others look and operate openly on main streets. These are legal Our drivers parked on a normal-looking residential street and we followed them up the driveway and through a gate into the backyard of one of the small, single-story houses. Once inside, the entire place looked just like any tiki bar hangout with wooden tables, chairs and bar with a palm frond roof. There were some musical instruments in a alcove, a large Coca-Cola sign hung on a wall and a fountain in the center gurgling water. There were even a few ducks wandering around. We ordered a round of beers and some potato chips and enjoyed our last outing in Havana before sailing to Cienfuegos. Our last day at sea featured lots of activities including a bridge tournament, dance classes, cooking demos and a few quiz contests. Our Destination, Expert, Dr. Jorge Arocha also gave two presentations, one in the morning on "Cuban Culture" and another in the afternoon on "The Cuban Landscape in the 20th Century." Our final port of call was Cienfuegos, a beautiful city in the south-central region of Cuba about 122 nautical miles from Havana. Upon entering Cienfuegos Bay we sailed past the impressive fortress of Nuestra Senora de los Angeles before docking at the pier. Known as the "Pearl of the South," Cienfuegos was originally settled by Taino indigenous people and later settled by French immigrants from Bordeaux and Louisiana so a French and European influence can been seen in the elegant architecture of many of the city's buildings. The views looking out to the bay were breathtaking as we drove in buses through the beautiful neighborhood of Punta Gorda on our way to tour some of these historic buildings. 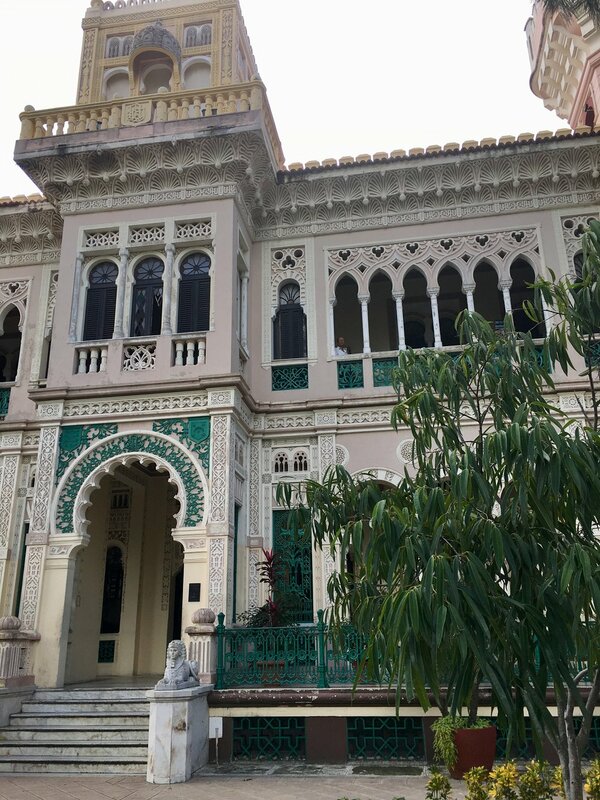 The most beautiful structure we saw in Cienfuegos was the Palacio de Valle, a spectacular example of Spanish-Moorish architecture with touches of Gothic, Romanesque and Baroque styles. We also visited art galleries and were treated to a live street performance featuring dancers, artists, musicians and actors. Art was very prevalent in all the cities we visited, perhaps because it gives Cubans a way to somewhat express themselves in a country that still has many restrictions on free expression. Art collectives and cultural groups are sprouting up across the country to help new artists find their footing. The cost associated with having a studio make it nearly impossible for a new artist to get started so art collectives have been setting up spaces that provide multiple workspaces and art supplies. Tubes of paint, brushes and canvases can be very expensive and hard to find so these collectives offer a place where artists can share resources. 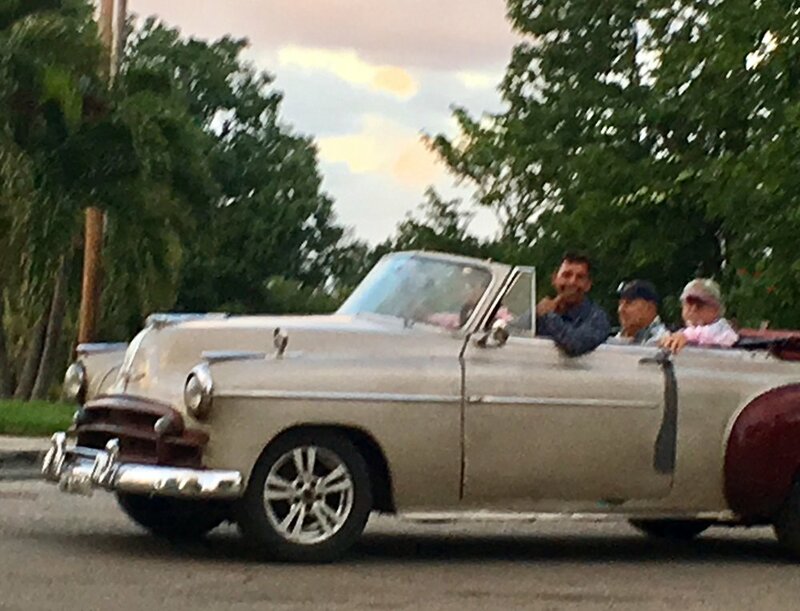 Our last day touring Cienfuegos embodied everything I had observed about the Cuban people during my time visiting their island. Despite the oppression they are under, I found Cubans to be optimistic, resourceful and proud. They seem to find happiness by expressing themselves through music, dance, art and conversing deeply with each other. I never once felt threatened or insecure; on the contrary, all the people we met seemed generally friendly. I have a feeling we will be visiting Cuba again in the future. After disembarkation, we headed straight to the airport for our flight home. If you're interested in booking a own cruise to Cuba we recommend AZAMARA Cruise Line's "10-Night Circle Cuba Voyage." We'd love to help with your travel plans. Contact us. Making the journey to visit Normandy and the battlefields of WWII is always an emotional experience and one that most people will make only once in a lifetime so when planning a trip you want to make sure you get it right. 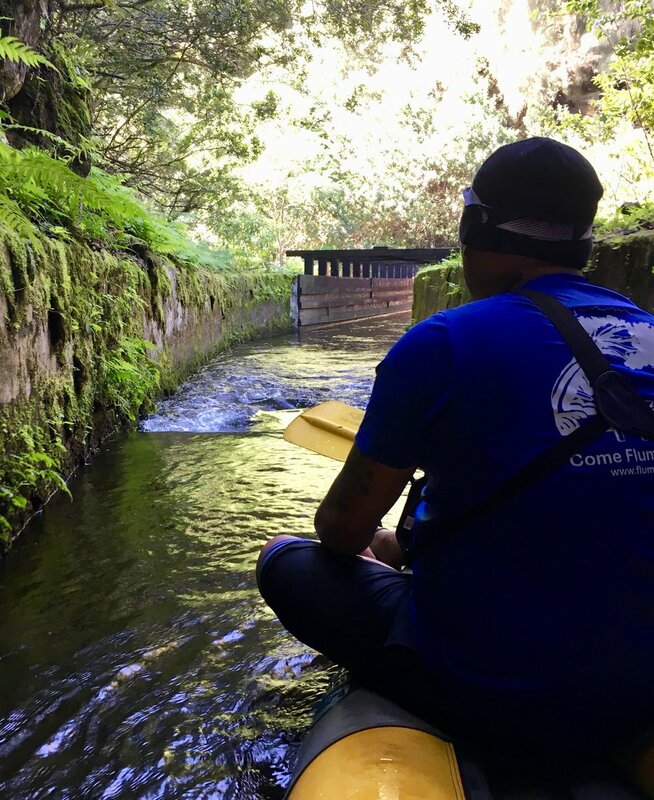 You can plan your own self-guided tour but hiring a local, expert guide will certainly enhance the experience and provide a much broader perspective. On this Veterans Day, as we honor those who served our country and remember those who gave everything, we'd like to introduce you to Trevor Standefer, an exceptional guide who provides various tours in Normandy. 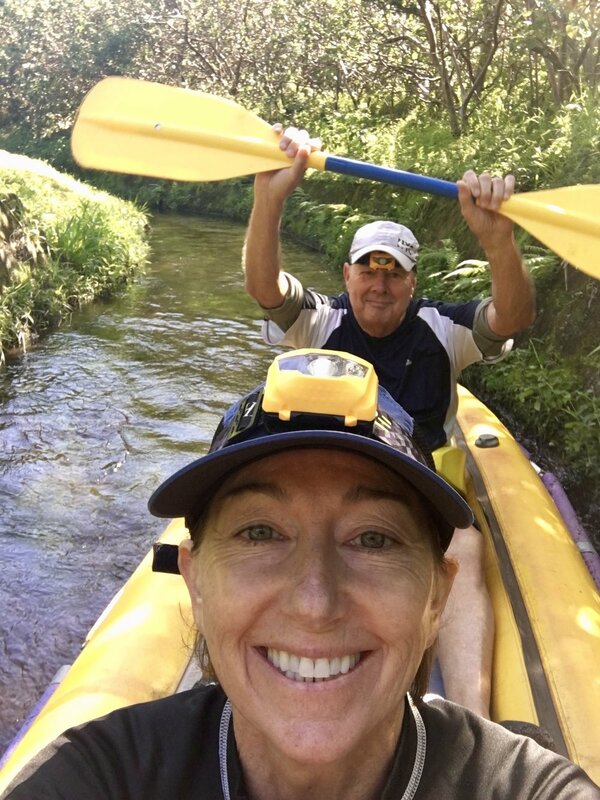 We've been on Trevor's tours and booked dozens of clients with him and everyone has always returned with rave reviews. 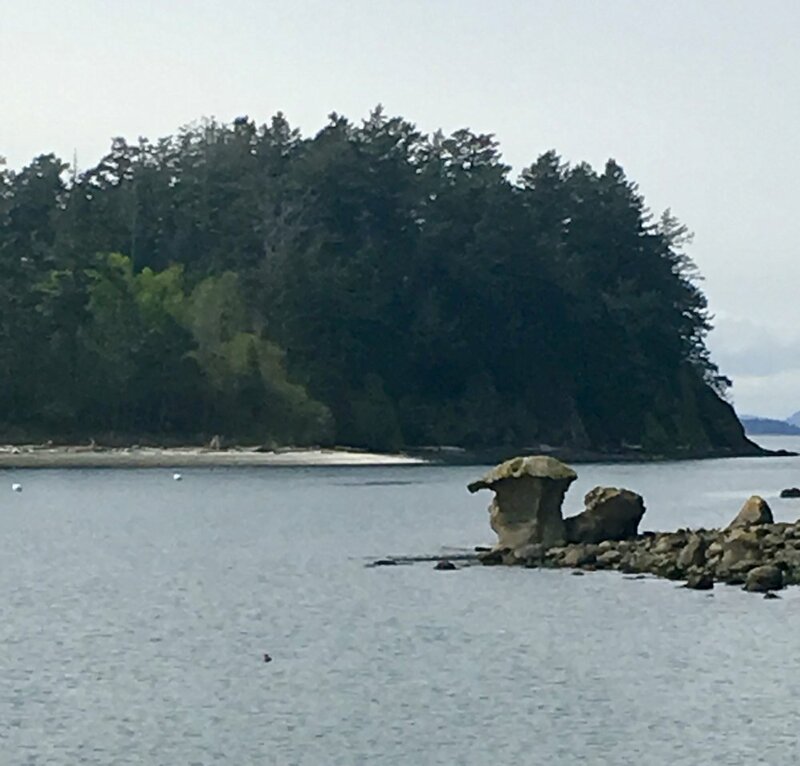 What makes Trevor's tours unique is his family's connection to the area. During WWII his grandmother was eight months pregnant and the family farm had become a strategic point for the Germans who took it over. As the liberation had begun, the family sought shelter in an abandoned farm in another town and it is here where American troops found them and sped Tervor's grandmother to a hospital where his mother, Danielle, was born on July 31, 1944. Danielle eventually met and married an American from Texas and that is where Trevor was born. He considers himself "Made in Texas, born in Normandy." Trevor traveled with his mother to France frequently growing up and he eventually met and married a French woman. Trevor has lived in Normandy for seven years and operates his American D-Day Tours company from his home near Utah Beach. 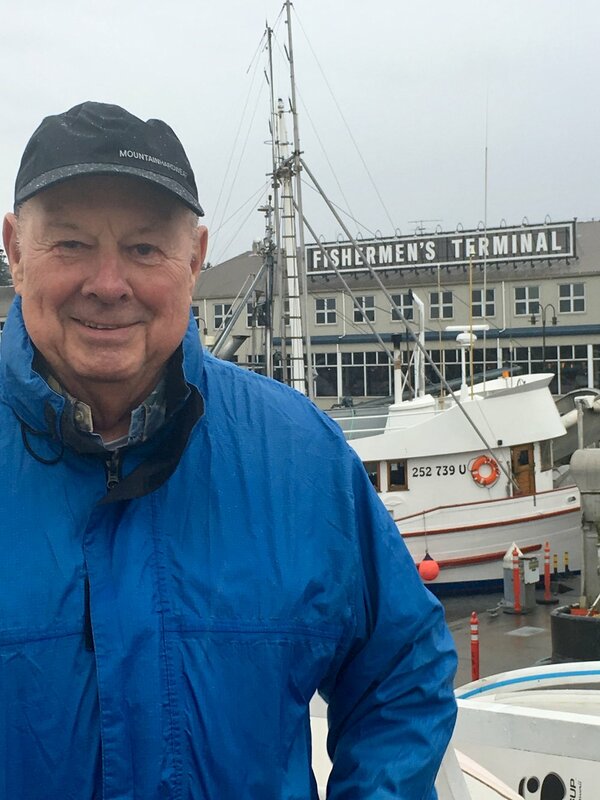 His tours range from 1-Day, 2-Day and VIP experiences to visit Sainte-Mere Eglise, Utah Beach, Pointe du Hoc, Omaha Beach, U.S. Military Cemetery, German Cemetery and military museums. Trevor is well versed in WWII history and his passion his evident as he recounts the events of D-Day on his tours. When we toured with him a few years ago I was impressed how he etched into the sand with a stick on Omaha Beach the entire troop landings and movements on D-Day. By the time he was done recounting the events of that day he had drawn a very large and detailed diagram of the troops and the obstacles they faced as they fought to overcome Hitler's defenses. It was poignant and left a lasting impression. He also meticulously planned each stop and timed our tour perfectly so we were at the American Cemetery at dusk when the flag was lowered while taps was played. We would definitely recommend staying at least two nights in Normandy when planning a visit. If you would like assistance planning a trip or have questions please feel free to contact us. For information about Trevor's American D-Day Tours click here. On our trip to England last August we spent one night in Oxford which didn't give us a lot of time to explore but we did squeeze in a walking tour of the university and then ventured about 1.5 miles beyond the city to a new craft distillery where a talented team of visionaries was launching its first bottled spirits after years of building every aspect of the business from the ground up. Five years is how long it took Tom Nicolson to lay the ground work and build the team that today is The Oxford Artisan Distillery (TOAD), the first legal distillery ever in Oxford. 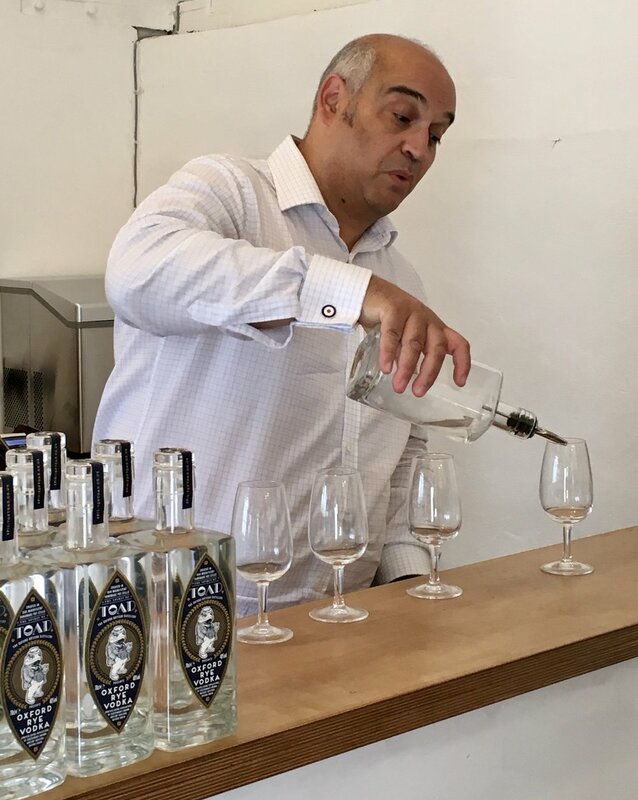 Nicolson, the founder and CEO of TOAD gave us a tour just days after the distillery released its first bottles of Oxford Dry Gin and Oxford Rye Vodka. TOAD is also in the process of crafting an absinthe made with more than twenty organic botanicals and a rye whiskey that has been laid down but needs to age. Nicolson, donning a wheat straw pork pie hat, picked us up at our hotel in the center of Oxford to transport us to the distillery just a short drive away. 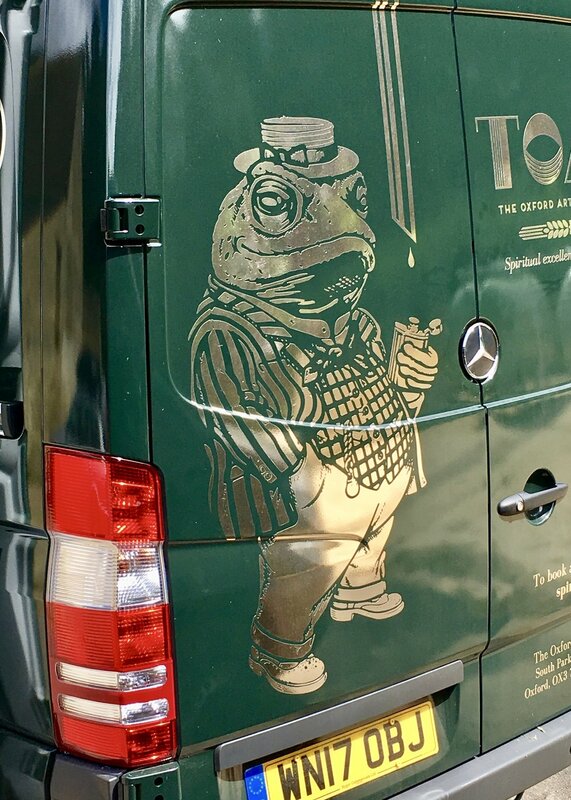 The distillery van was easily recognizable as it pulled in front of our hotel with its TOAD logo and illustration of the distillery's dapper, amphibian mascot, George, wearing a boater hat. The distillery sits on a site which dates back to the 18th century when it was owned by a local family and the property was known as Cheney Farm. An original threshing barn still stood on the property now known as the Old Depot in South Park and is under the control of the Oxford Preservation Trust which has leased it to TOAD. There were a couple of carpenters working on projects around the property and the distillery seemed to be in "soft opening" mode with shipment boxes stacked on the floor and marketing materials laying around. Behind a counter, Chief Operating Officer, Tagore Ramoutar, was unpacking boxes of glassware and stocking the tasting bar where we would later sip the new vodka and gin. Nicolson and Ramoutar met at a networking event for start-ups in 2014 and soon after began working together on detailed plans and a strategy for Oxford's first craft distillery. Unpacking boxes seemed a rather mundane task for an experienced entrepreneur and new venture expert who had already notched many business successes on the global stage but Ramoutar had a relaxed smile on his face and looked as though he was having a great time as part of this distillery venture. Nicolson too, came from an impressive business background. His career in the music industry and creating successful recording studios in London had fueled his passion for business and creativity but in 2012 he was ready for a new challenge. That's when the wheels for the inception of TOAD were put in motion. 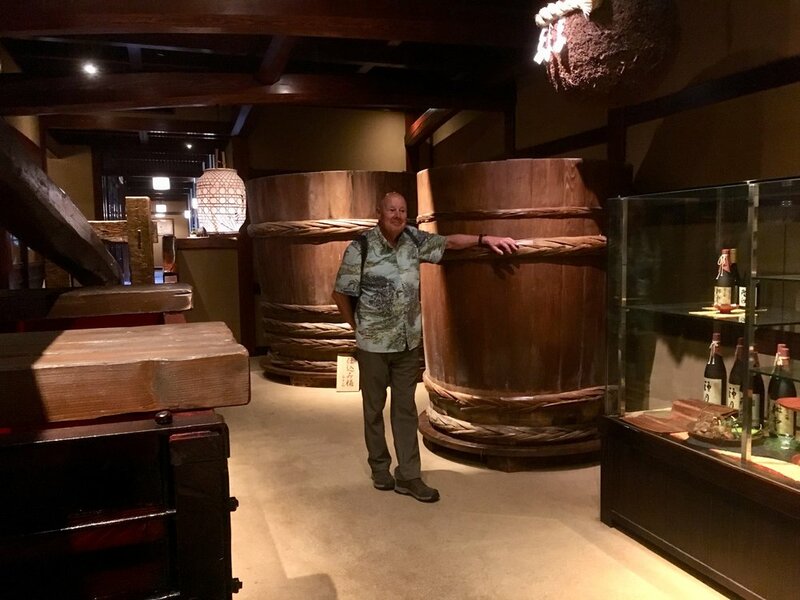 He had become interested in craft distilling and started to investigate the possibility of opening his own distillery. Nicolson had come from a family with a history of working in the wine and whiskey business in Scotland for generations, a tradition that ended when his father left the industry to pursue life as a vicar. Nicolson joked that his father gave up one kind of spirit for another. After talking to people in the industry and doing his own due diligence, Nicolson decided to fully commit himself to opening Oxford's first craft distillery. We made our way to the distilling building where two impressive and gleaming copper stills with towering distillation columns were housed. These were not run-of-the-mill stills, they were custom designed and hand made. As Nicolson proudly patted the larger of the two he told us these stills had been designed and built by a man named Paul Pridham, one of England's last great steam engine boiler makers of the South Devon Railway. Nicolson had reached out to Pridham who worked for two years to create these custom, hand-riveted stills. The large 2200-litre still is named Nautilus and the smaller, 500-litre still is named Nemo - a clever nod to the author Jules Verne and his novel, Twenty Thousand Leagues Under the Sea. As Nicolson explained the distilling process he told us about the farmer who provides the grains TOAD uses in making its spirits - grains which distinguish TOAD's spirits from those of any other distiller in the world. The story of their origin was quite fascinating. John Letts, an archaeo-botanist and well known organic farmer from Oxford discovered various ancient grains in the base layer of thatch removed from a medieval house from which he began to develop genetically diverse seed mixes of wheat, rye, oats and barley. Nicolson and Letts first met in 2013 at a farmers' market where the farmer was hoping to attract artisan bakers to buy his flour made from sustainably-grown, ancient and heritage grains. Nicolson was intrigued with Letts' approach to growing grains for this flour but saw another angle. 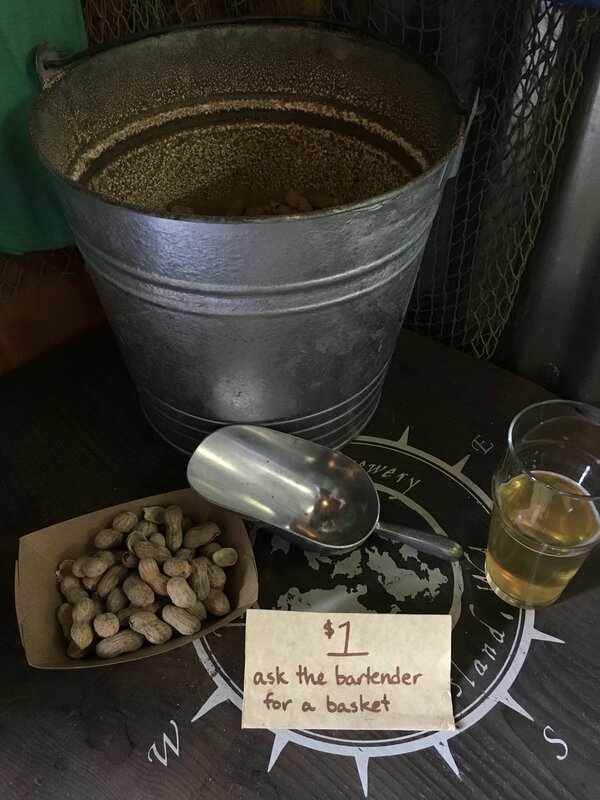 "I think you're missing a trick," he told Letts, suggesting maybe these ancient grains could be used for distilling spirits. The two kept in touch and in 2015 TOAD signed an exclusive contract with Letts to use his populations of ancient heritage grains (in perpetuity) for distilling. All of the heritage grains come from fields within 50 miles of Oxford. TOAD claims to be the only distillery in the world to use populations of these types of grains in is distilling. Next, we took a peek inside the 18th century threshing barn where the rye whiskey would eventually be laid down to age after the distilling process. This is the only building from the original farm that is still on the site. Instead of seeing it as a preservation nuisance, Nicolson sees it as an enhancement to the story of TOAD and its historical connection to community of Oxford. We made our way to the lab where the work of Cory Mason takes place. It was a modest-sized room filled with beakers, scales, bottles, grain bags and other ingredients. Mason was not on site that day but he, like the other members of TOAD, comes from an impressive background. Nicolson and Mason met back in 2013 when opening a distillery was still just an idea but the two "clicked" and seemed to share the same vision. Mason, an award-winning Master Distiller who made a name for himself in New York City with management roles in bars and restaurants including "Employees Only," (once voted one of the best cocktail bars in the world). 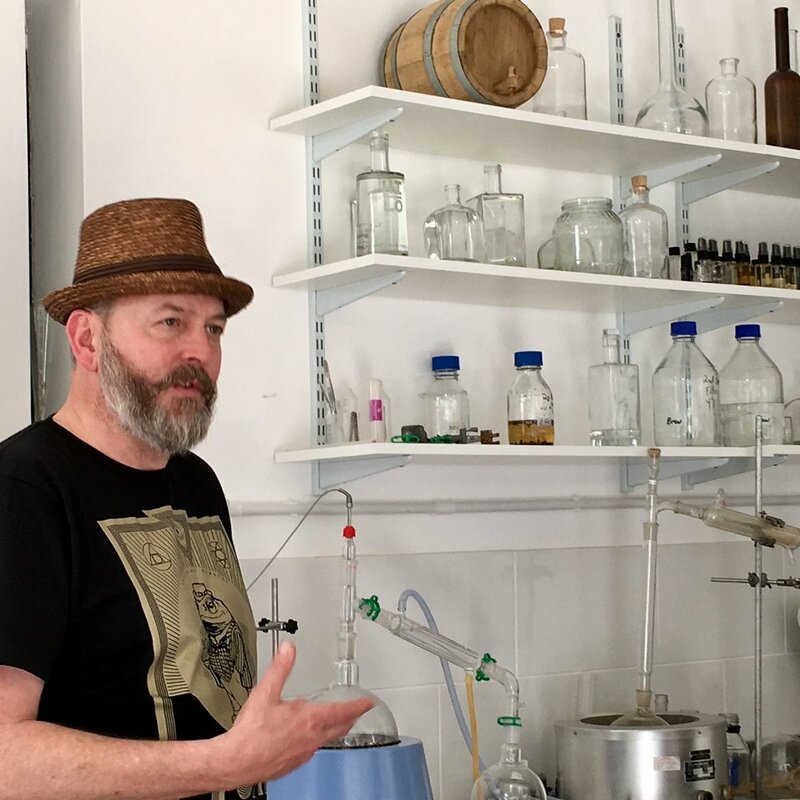 He honed his distilling skills at the International Centre for Brewing and Distilling at Heriot-Watt University in Edinburgh and his long list of accomplishments include developing more than 15 commercially released spirits. Today he is the Master Distiller of TOAD. 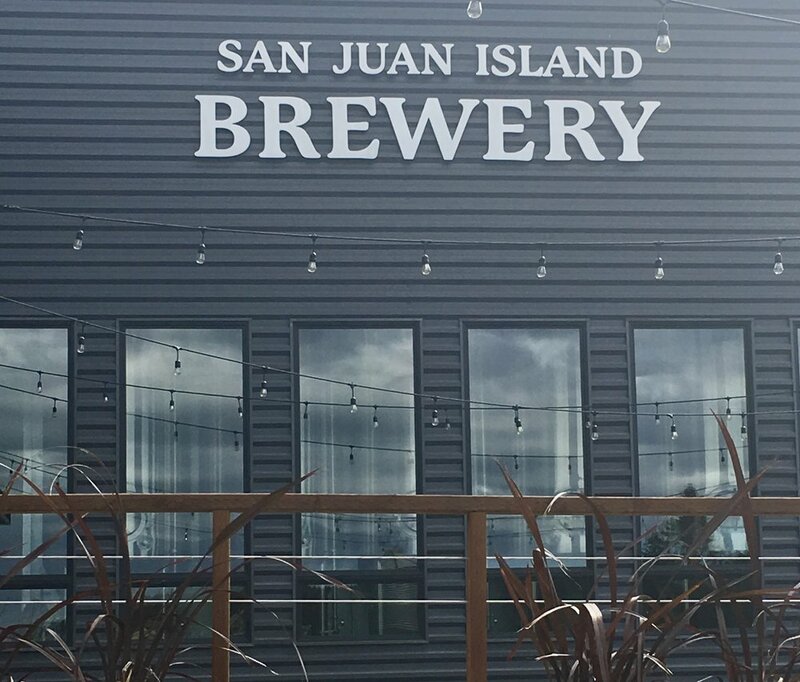 There is room to grow on the property and Nicolson has plans to add a bar, restaurant and visitor center. 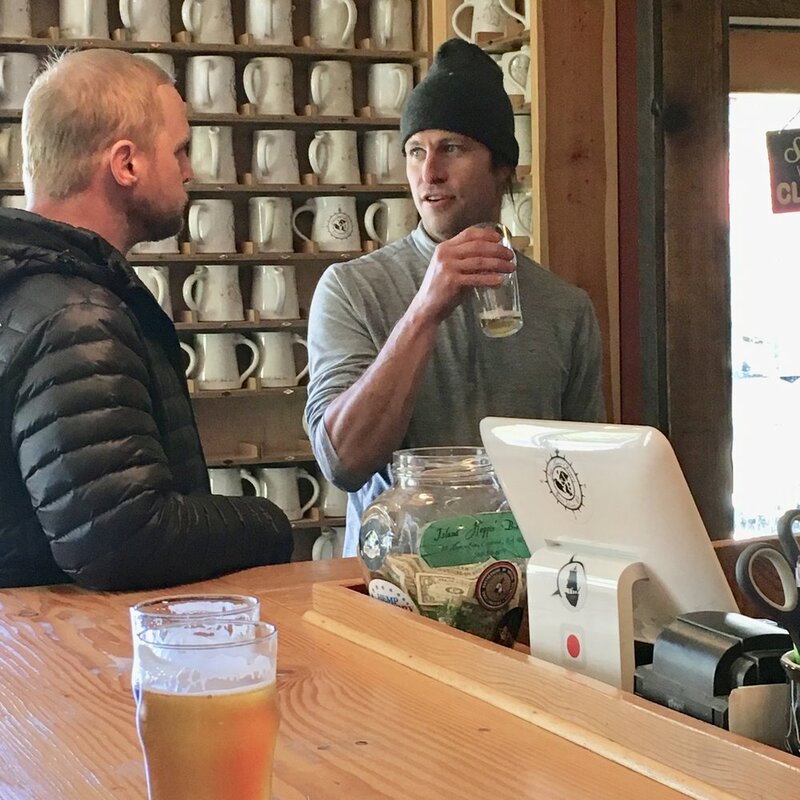 He's been busy getting the word out about TOAD and in addition to the regularly scheduled distillery tours, Nicolson has been inviting the local community to a few "Open Days" at the distillery where folks can get a behind-the-scenes look at the operation. Nicolson invites local food purveyors, beer breweries and car clubs to help with the festivities all the while educating his local guests about TOAD. He wants very much for TOAD to be part of the community and he wants the community to be part of TOAD. To prove it, the distillery will open up its shares to the public in an attempt to raise £1million in a crowdfunding campaign some time this fall. We just might buy in too! 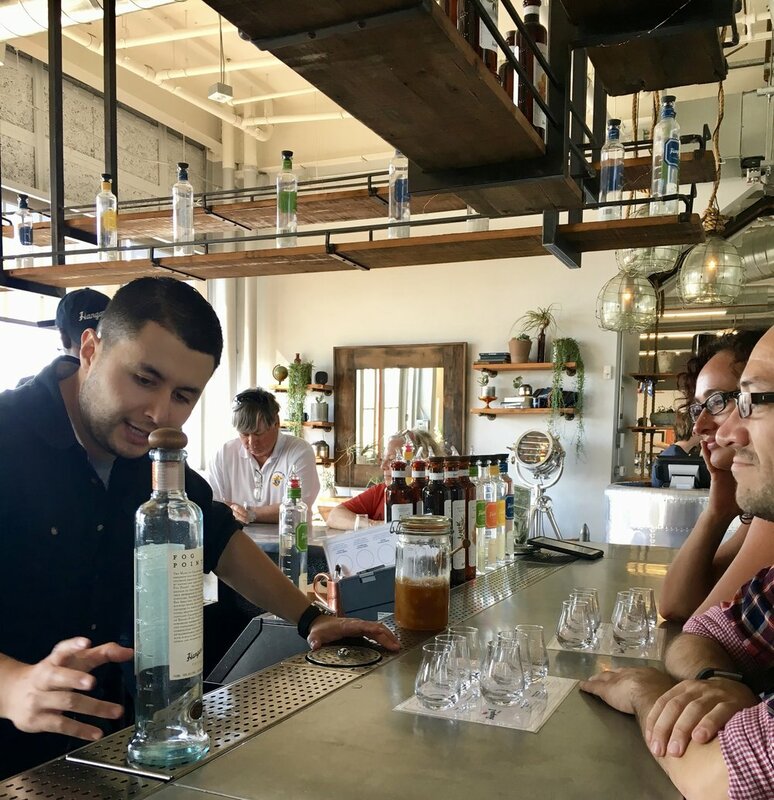 We finally made our way back to the tasting room where Ramoutar was waiting to treat us to tastings of the newly bottled Oxford Dry Gin and Oxford Rye Vodka. Both were so smooth and very easy to sip straight up. We could taste a very slight toffee flavor in the vodka which Ramoutar explained was from the ancient grains. We tasted the gin mixed with some tonic, lemon and lime and it really was the best gin and tonic I've ever had. We bought two bottles of gin to take with us to the Cotswolds where we planned to hike for the next few days. The name of the distillery provided a basis for the apt acronym, TOAD, a happenstance not lost on Nicolson. One of his favorite books as a child was The Wind in the Willows, the story of friendship and adventures of a band of anthropomorphized animals in the English wood including the frolicsome standout character, Toad, who may or may not have been a source of inspiration for the distillery mascot, George. Similar to the characters in the children's book, Nicolson and his colleagues seem to be enjoying their own adventures and camaraderie as they build their distillery business in the English countryside. Cheers to them! 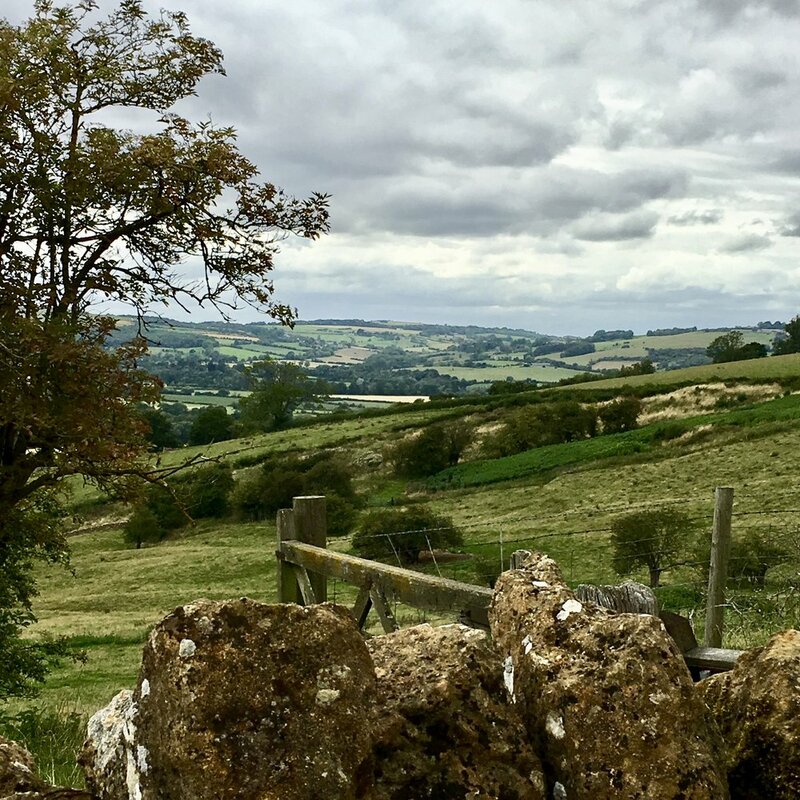 The Cotswolds is a vast area which covers nearly 800-square miles spanning six counties and has a seemingly endless number of trails to choose from - some circular, some linear, but all offering beautiful pastoral scenery and sweeping views of the English countryside. 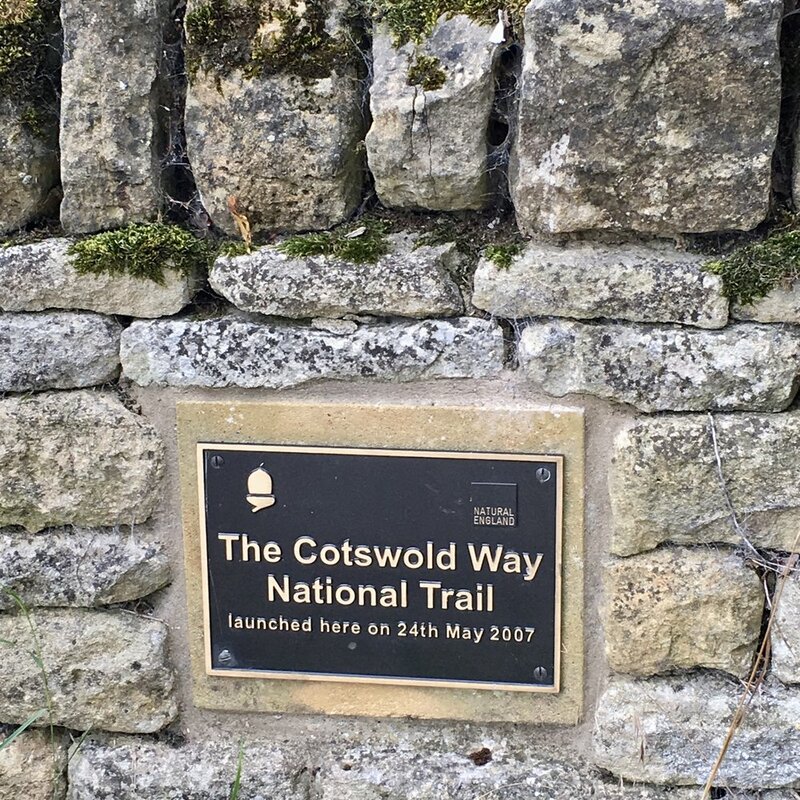 Perhaps the most famous trail is the 102-mile Cotswold Way which stretches from Bath to Chipping Campden and can take 7-10 days to complete, but there are many other shorter routes already mapped and waymarked that traverse many of the same quaint towns and villages that you can complete in 2-5 days. Determining which route to take really depends on what you want to see, how far you're willing to walk, what type of accommodations you prefer and your budget. 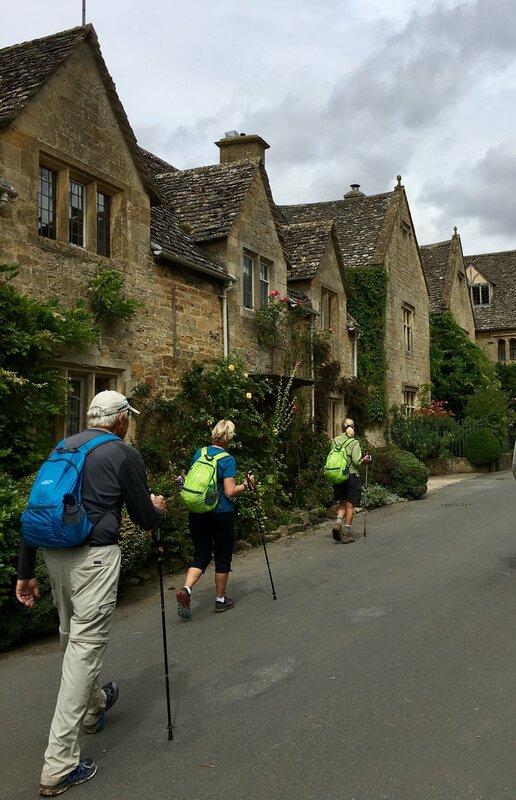 Our group of eight decided on the Cotswold Round - a five-night, 4-day circular route - designed to take in some of the most picturesque villages and towns in the Cotswold countryside with a few steep climbs to breathtaking panoramic views. Our walk started and ended in Moreton-in-Marsh, once an important staging area for horse-drawn carriages making their way to London and many of the inns, pubs and homes in this town today were once coaching inns. We walked an average of 12.8 miles each day which didn't leave much time for sightseeing. We started our walks at 9 a.m. everyday and usually finished between 3:30-5:00pm. By the time we showered and had a drink it was usually time for dinner and shops were closed. If you want to have more free time in the towns then consider walking fewer miles each day. We ran into several people who were only walking 6-7 miles per day. There are many tour operators that offer walks of various distances along many routes and will transfer your luggage to the next town as ours did. 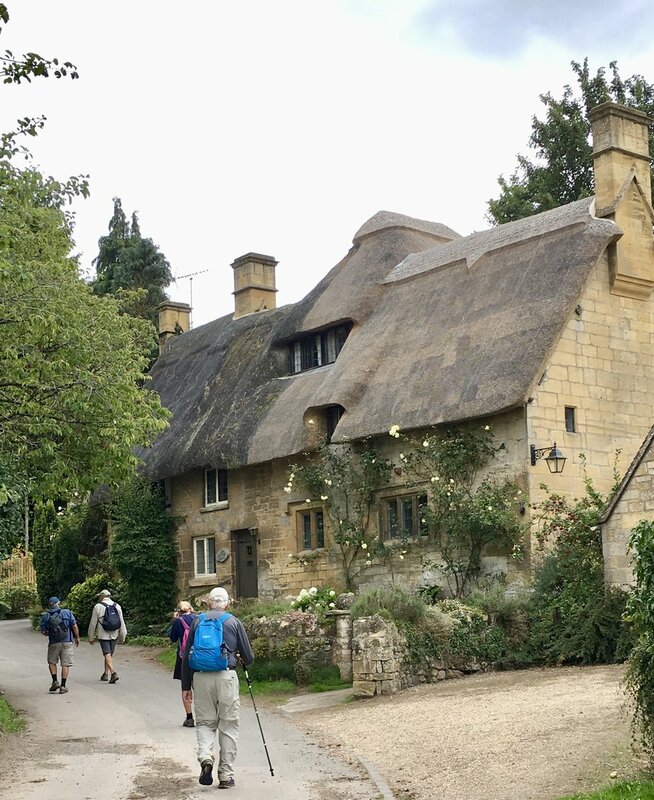 Along the way we visited more than a dozen villages and towns and connected onto other trails for brief stretches which included the Monarch's Way, Windrush Way, Wardens Way and sections of the Cotswolds Way. 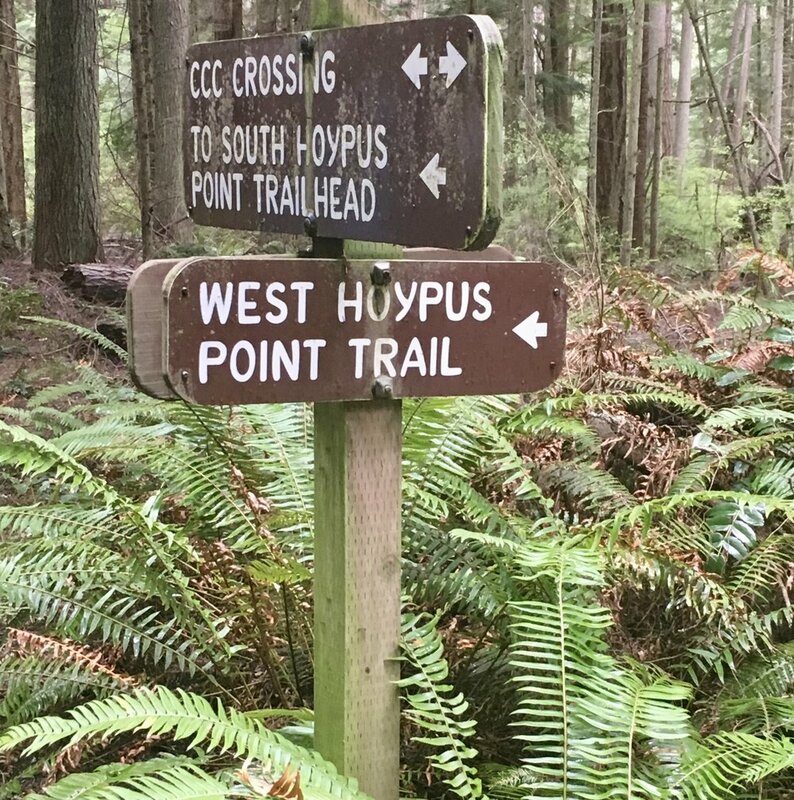 Our first day on the trail proved to be a challenge with seemingly convoluted directions and elusive waymarkings which slowed us down. However, by the second day we found the directions much easier to follow or our navigation skills had improved - not sure which. We had two people reading directions while the rest of us looked for landmarks, waymarkers, fingerposts, gates, hedges, fences, stiles or other vital signs that would keep us on track. The scenery on our walk was ever-changing as were the paths we walked on. We climbed grassy hills, followed cuts through farm fields, walked down country lanes, shared bridle paths with horses and riders, hiked a single-track path through a wood and occasionally plodded through mud or wet, sticky clay that required a good boot scrubbing at the end of the day. There were also trails fringed with stinging nettle that got our attention but caused no real harm. We noticed a few restaurants and pubs provided plastic bags to ramblers wearing muddy boots and some clientele just left their boots outside and enjoyed a pint while in their stockings. One path even skirted a golf course where we came upon a friendly foursome who didn't mind us watching them tee off. Stopping at a pub for lunch was a highlight each day and we always tried to find something at the halfway point of our walk but sometimes it was a bit of a challenge getting the timing just right. I recommend keeping some snacks like nuts, cheese and fruit in your day pack in case you need something to nibble on before you find a place to stop. The food was always good and we drank our fair share of beers along the way. A few pubs where we stopped displayed a "CAMRA" decal which recognized the pub as one listed in the CAMRA Best Beer Guide. CAMRA, which stands for Campaign for Real Ale, has been around since 1971 and in addition to publishing a beer guide, its mission is to promote quality ales and bolster support for local pubs in hopes they can thrive amidst ever-growing competition and higher taxes. 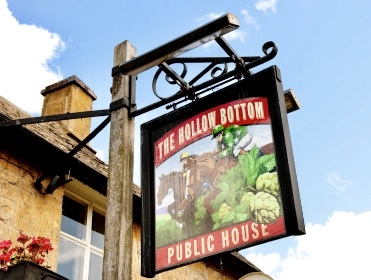 CAMRA believes local pubs play a critical role in English culture as the hub of community life but in some areas, as wealthy residents move in, pubs are left behind as new fine dining establishments crop up. Real estate has been on a roll in the Cotswolds and demand in the area of Gloucestershire has driven up home prices more than 15% over last year. 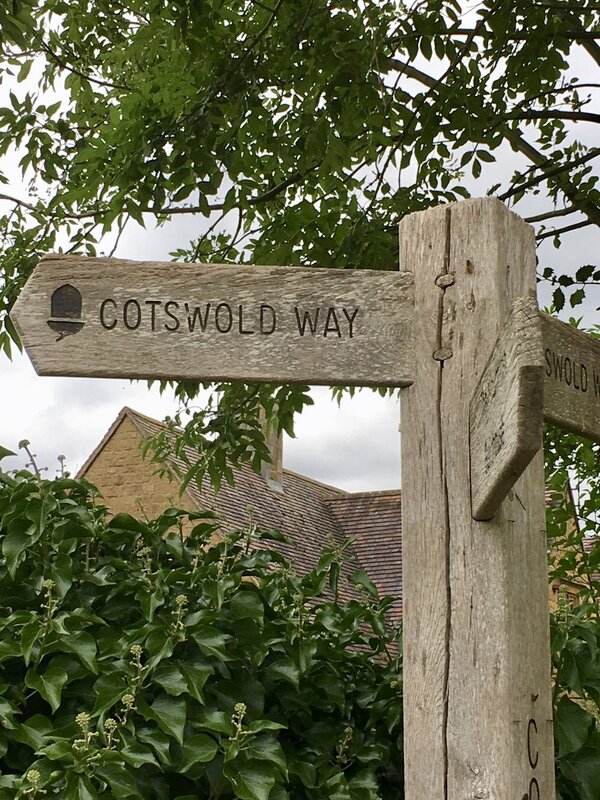 The Cotswolds have become a favored destination of the well-heeled and in the posh area of Chipping Norton, David and Victoria Beckham (See what I just did there?) just plunked down £6million ($8.079million) for a home they plan to remodel. 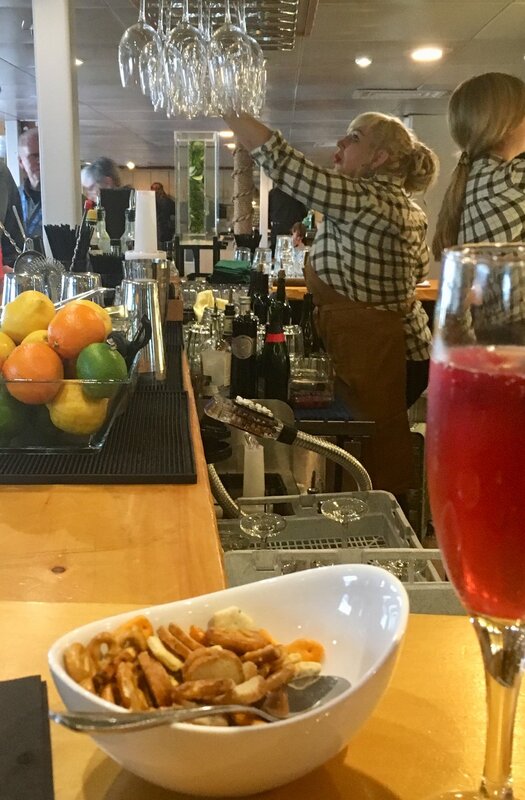 A local couple in one town did try to direct us to a different pub, saying it would be three times cheaper than where we were headed. I didn't take many pub or restaurant pics partly because I don't like taking photos during meals and also there was really no extra time during our breaks. I also didn't take pictures of the inns or B&Bs where we stayed but all were nice and had great hosts. The larger inns with restaurants worked out the best for us because at the end of the day after walking 12-14 miles we really didn't feel like walking another couple of miles back into town for dinner. Everywhere we stayed included full English breakfast. 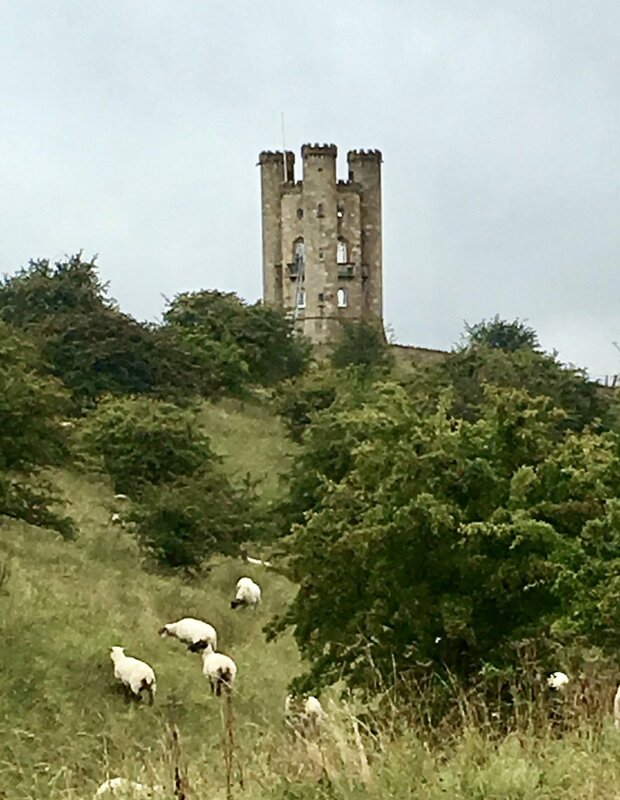 There were lots of buildings and structures of historical note throughout the Cotswolds including Civil War ruins, towers, dovecotes, castles, memorial markers, abbeys and wool churches. Much of the affluence in the Cotswolds centuries ago is attributed to the wealthy farmers and merchants who benefited from the wool trade and built large estates and donated generously to the churches, many still standing. 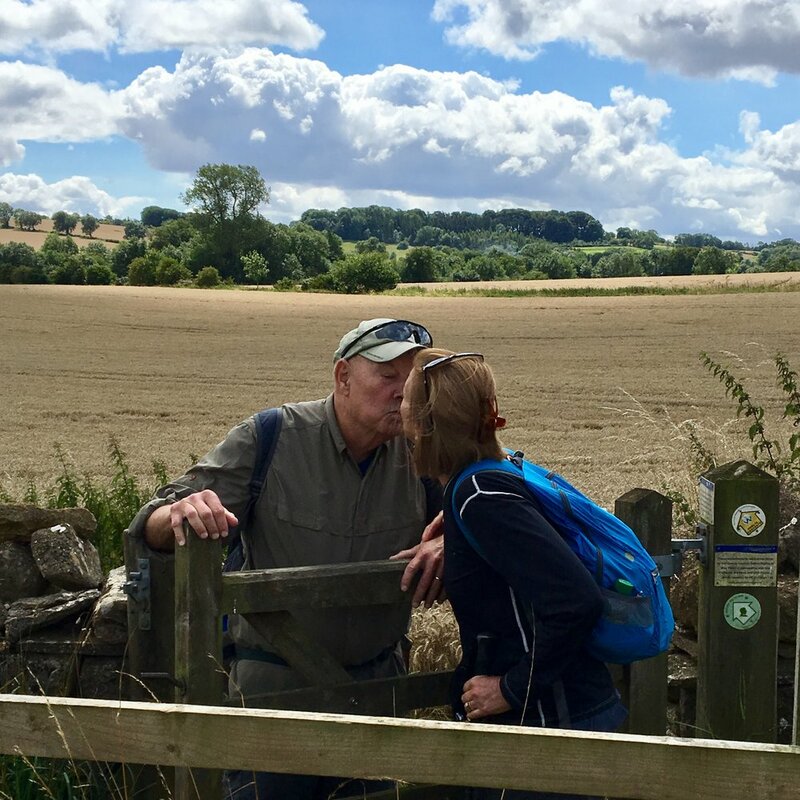 Our trails led us through some private land at times and provided up-close views at the daily work taking place on a farm or a glimpse into a perfectly-manicured English garden of a stately manor. The honey-colored stone cottages and thatched-roof houses reminded me of fairytale illustrations from books I'd read as a child. One of my favorite memories from this trip was when a farmer released his cows into the field where we were walking and we watched as his working dogs herded them to another field. While the farmer strolled along and talked with us, his two dogs worked together to move the cows the length of the long field and into an open gate waiting at the other end. Even though we spent all day, every day walking during this vacation Larry and I still felt like it was one of the most relaxing trips we've ever taken. 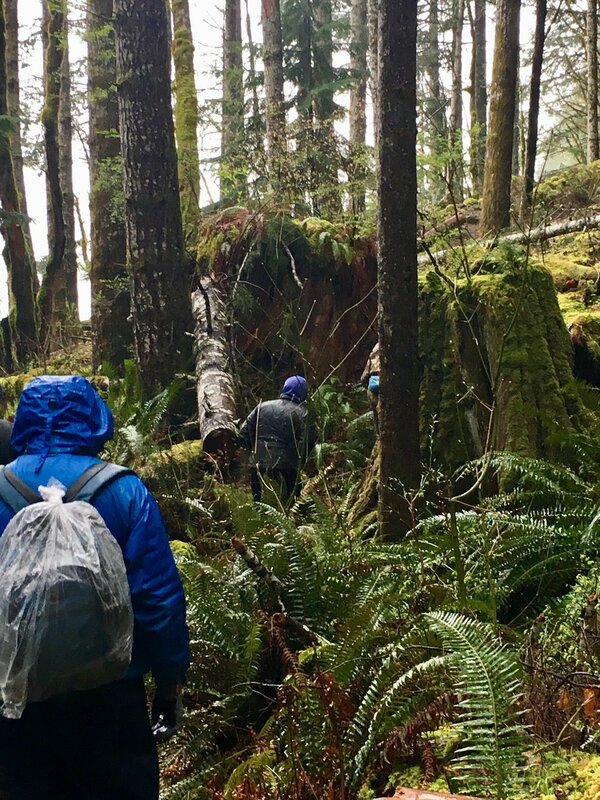 Walking the trail was quiet and scenic and we felt a sense of satisfaction in reaching our goal at the end of each day. 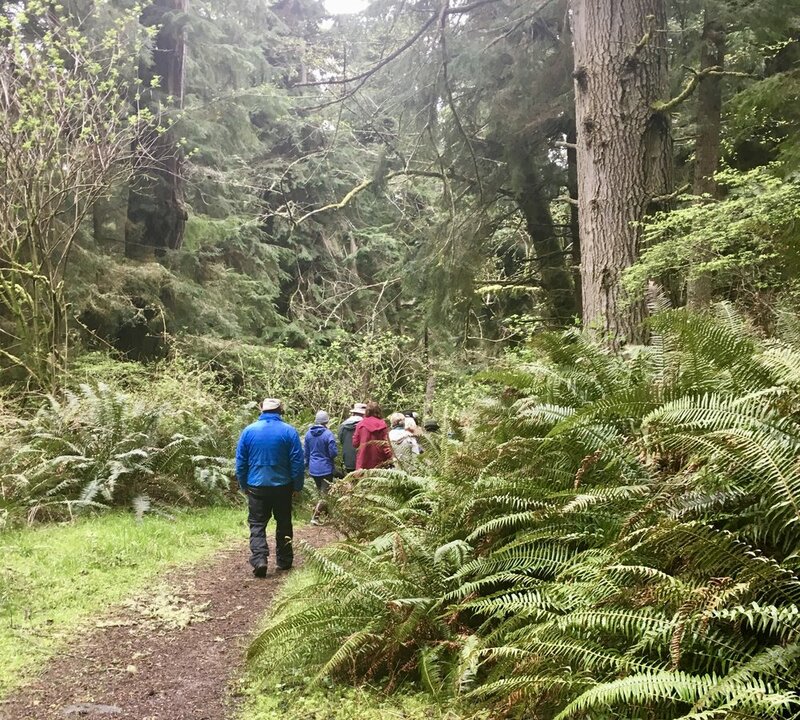 We had moments of walking alone and times when we all were bunched together - talking and laughing, and there may have been a few expletives expressed while going up a steep ascent but we all had a great time. 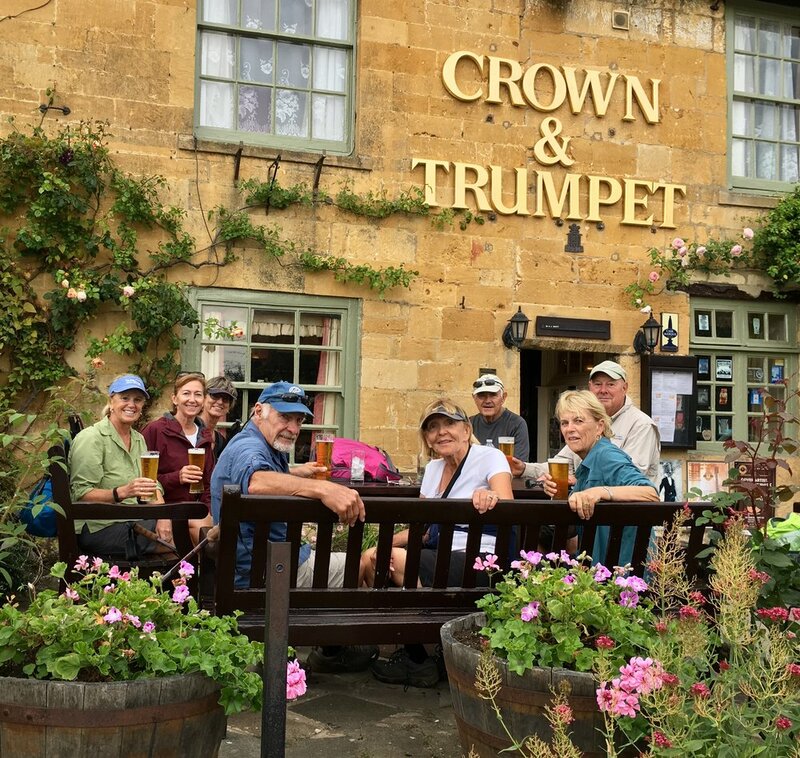 A few of us were a little sad when the trek was over and might go back to walk the entire 102-mile Cotswold Way in the near future. 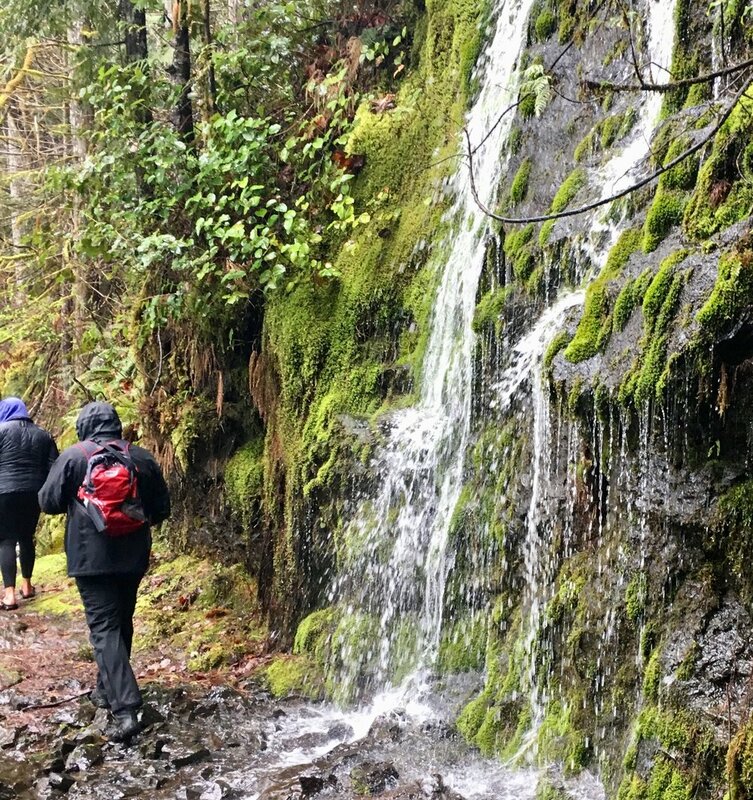 Thank you to Megan, Randi, Sally, Vikki, Bill and George for joining us on this adventure. Day 6: Depart from Moreton-in-Marsh after breakfast. 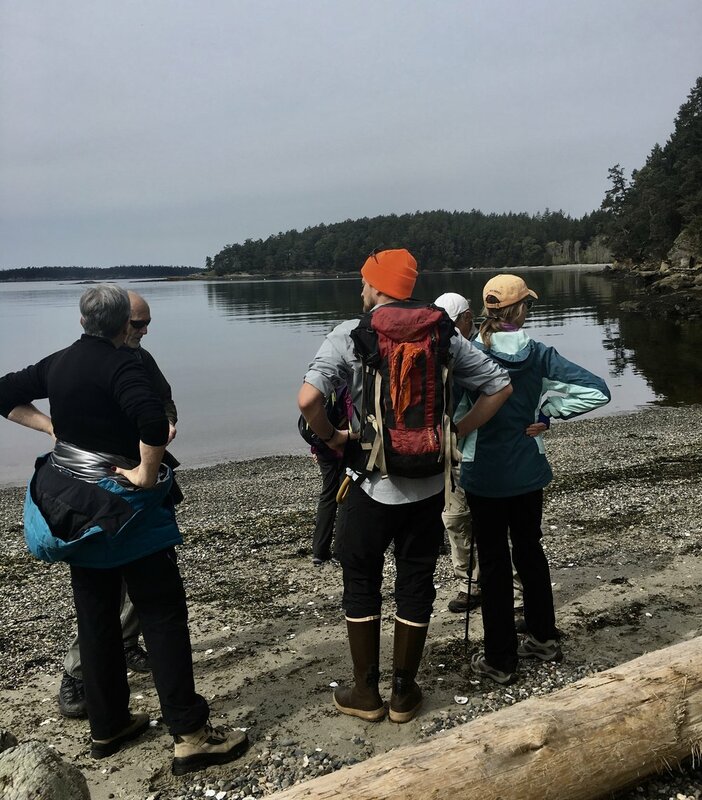 Wear sturdy trail shoes or hiking boots and make sure you have trained comparable distances wearing them before your trip. Train. We walked at least 4-6 miles four or five times a week for at least a month prior to our trip. We also fit in a few longer walks of 7-8 miles. Pack light. Most tour operators allow only one piece of luggage to be transported to your next accommodation each day. 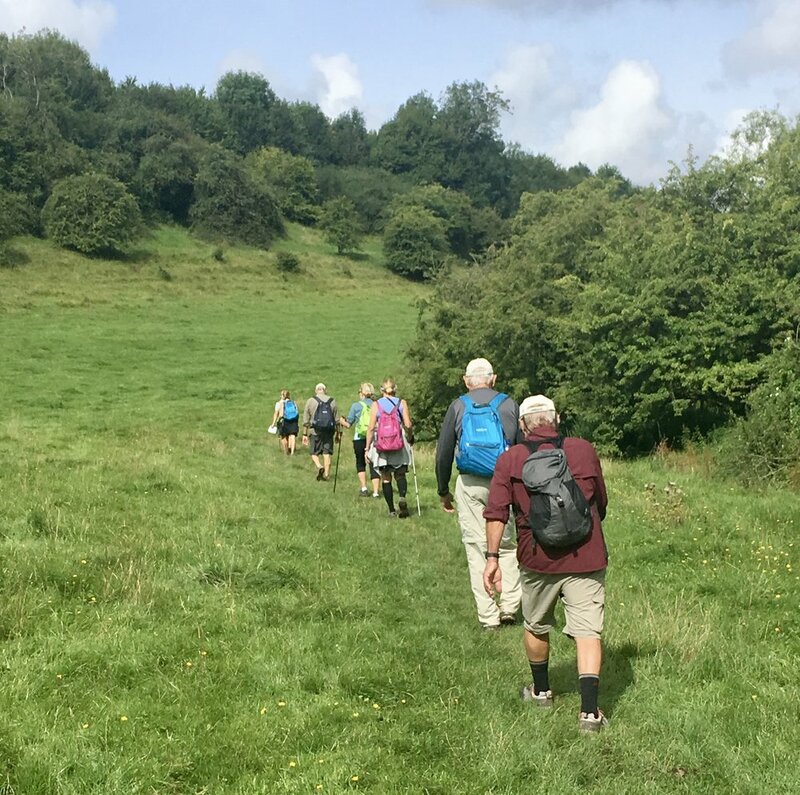 If you're interested in taking a walk in the Cotswolds and would like help planning your trip, we'd love to assist you. Working with a travel agent will never increase the cost of a trip but it will usually enhance it.